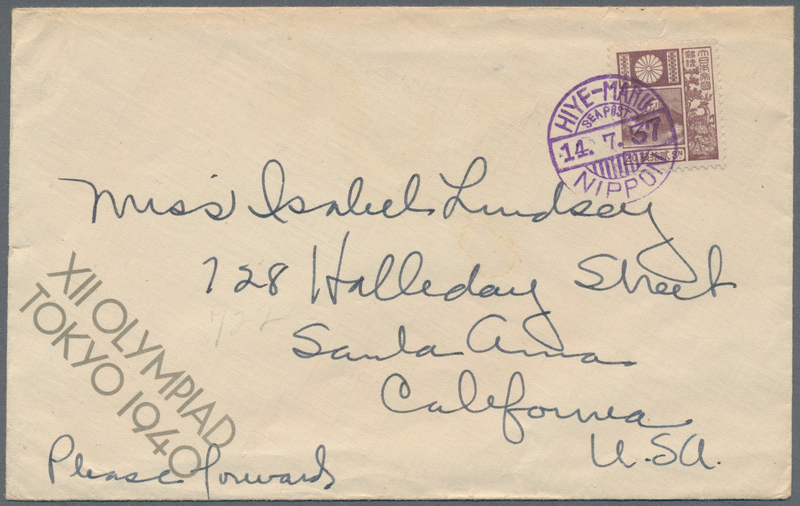 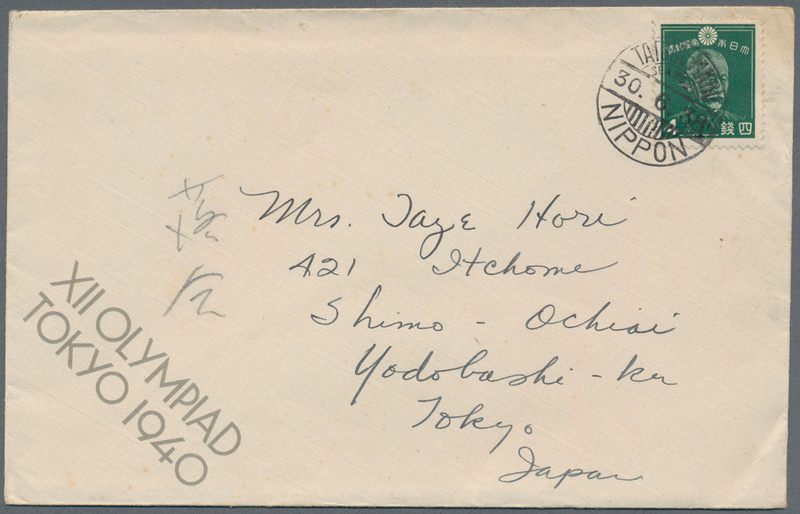 10468 Brief (cover) 190II 1937, "XII Olympiad Tokyo 1940" official logo special NYK envelope w. Fuji-Deer 20 S. violet tied clear "HIYE-MARU SEAPOST 14.7.37" to Santa Ana/Cal., USA. 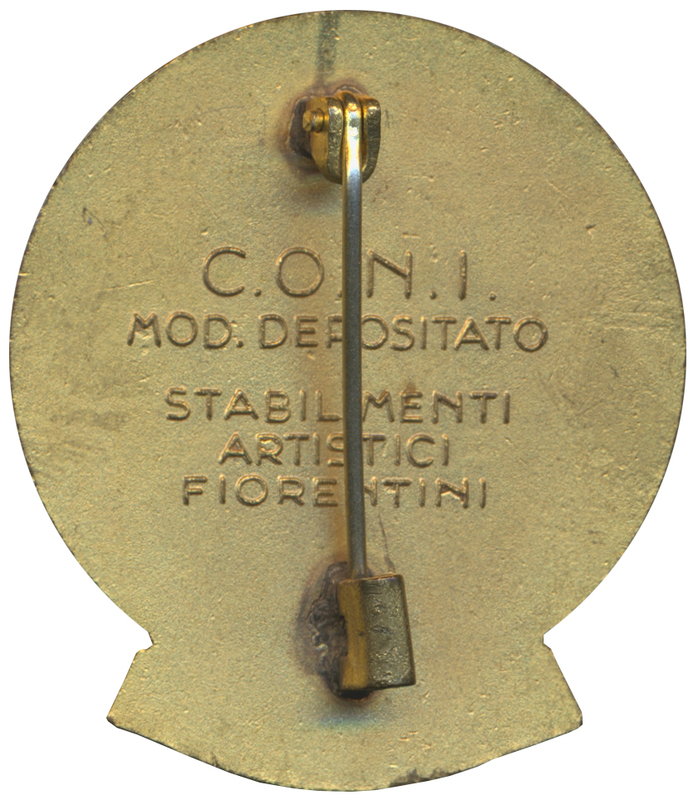 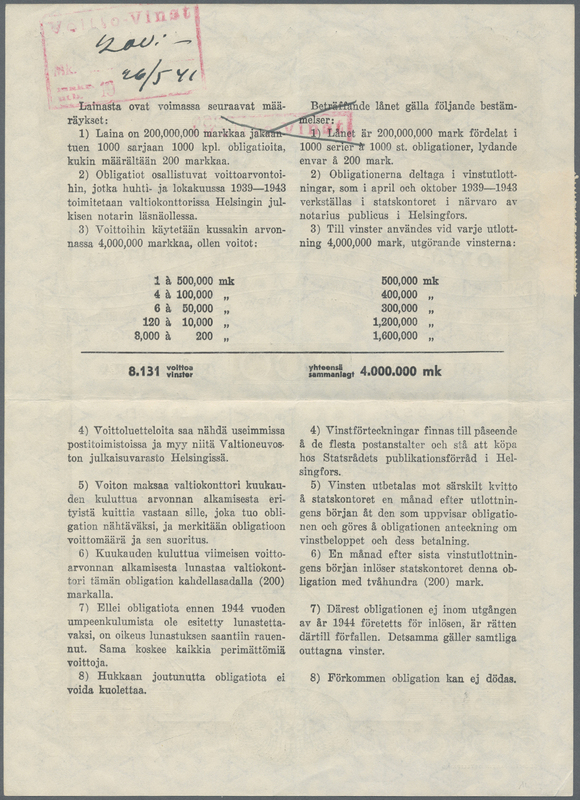 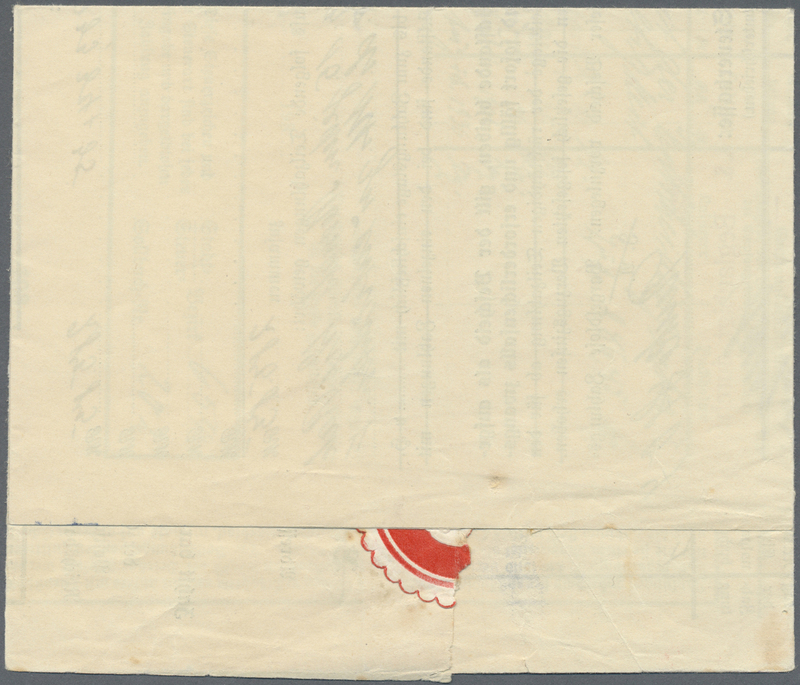 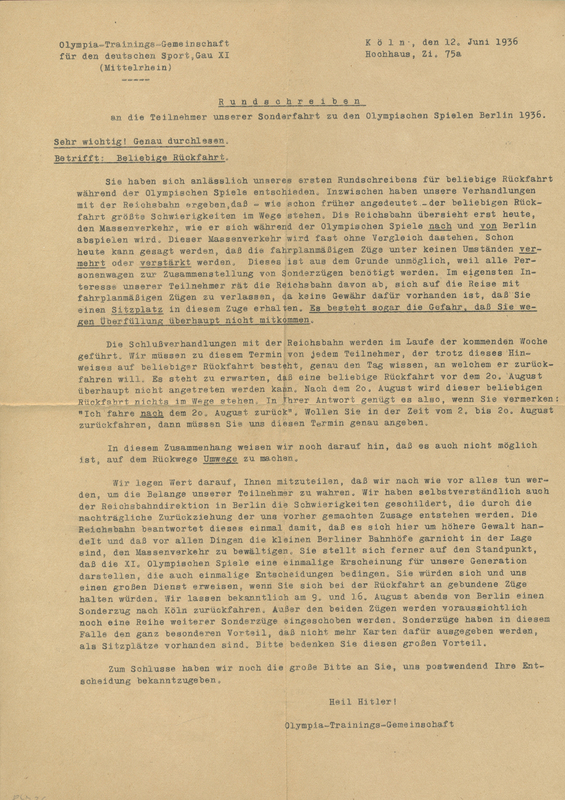 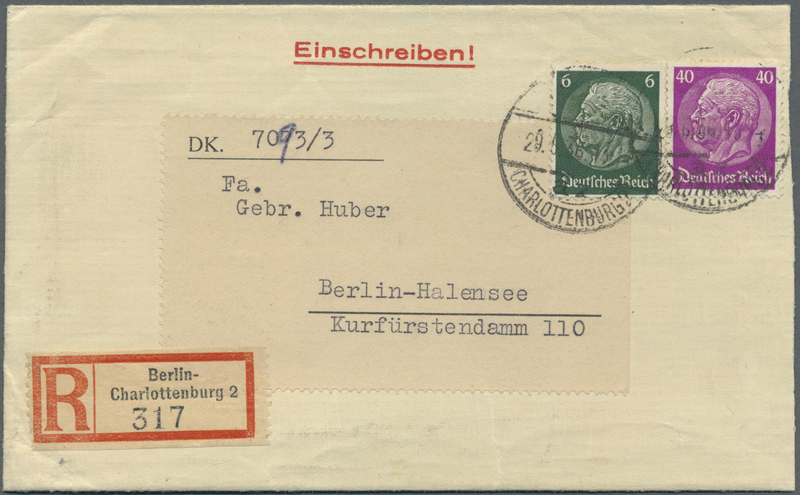 10469 Brief (cover) 238, 241, 245 etc. 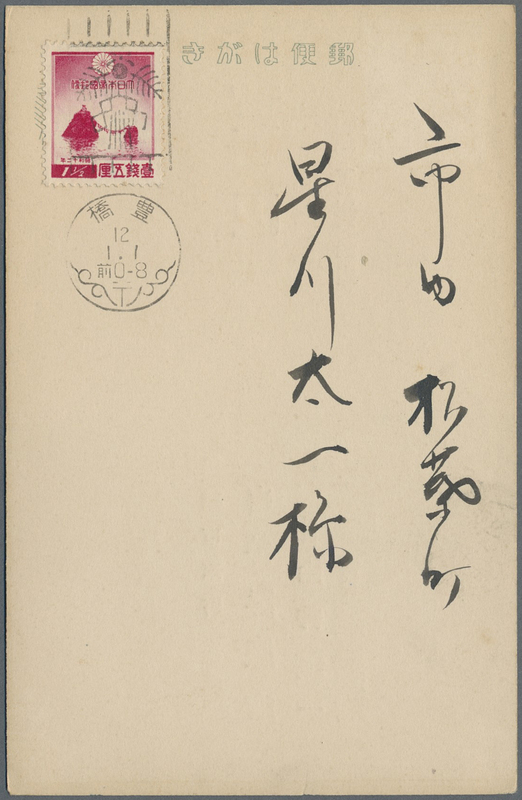 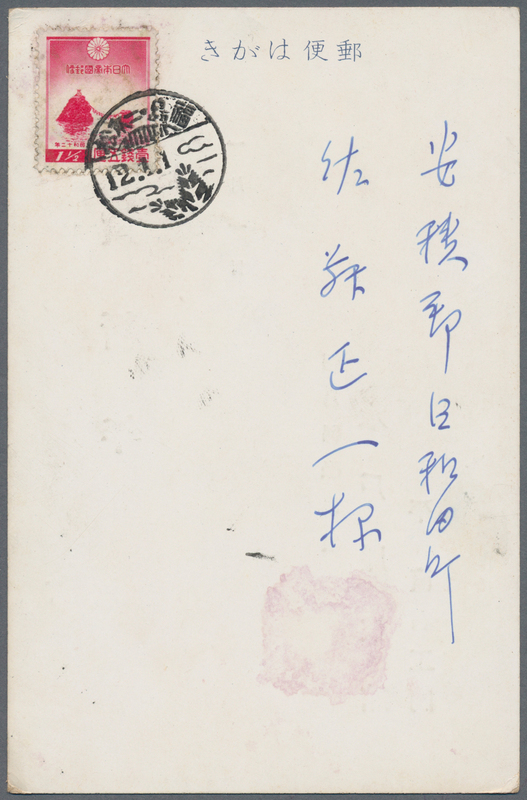 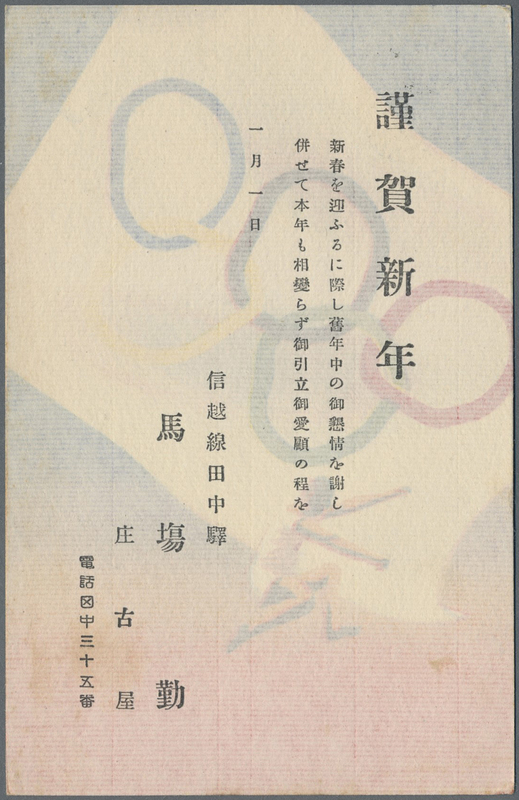 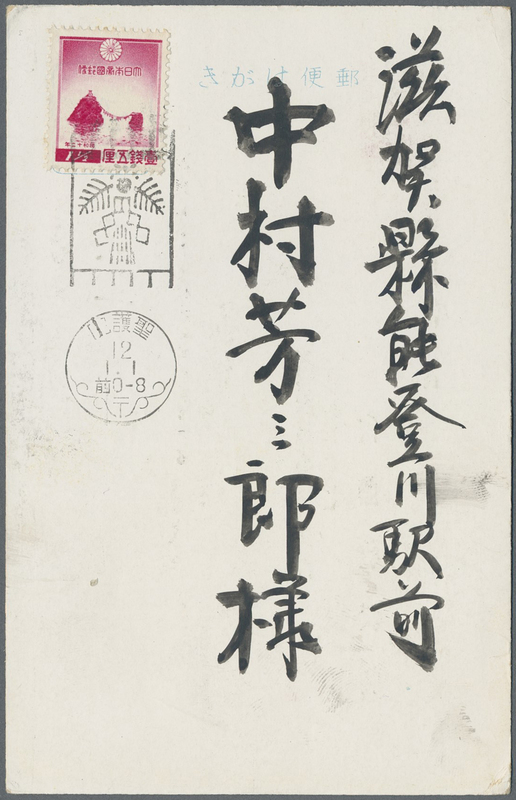 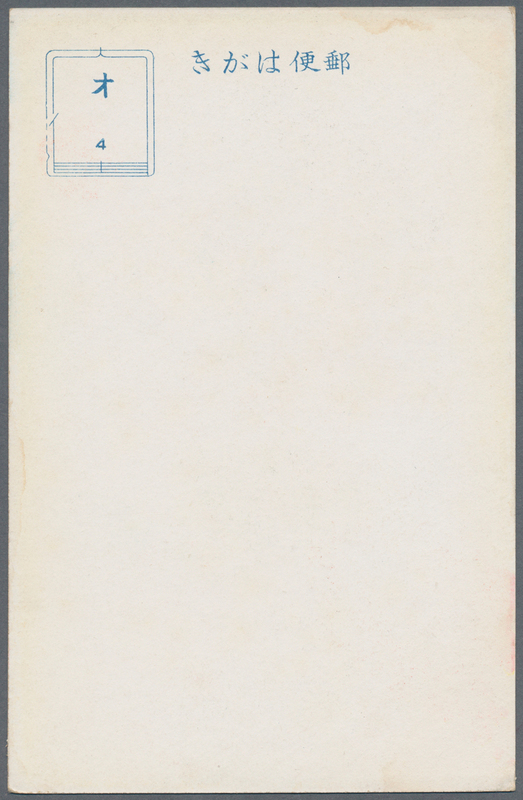 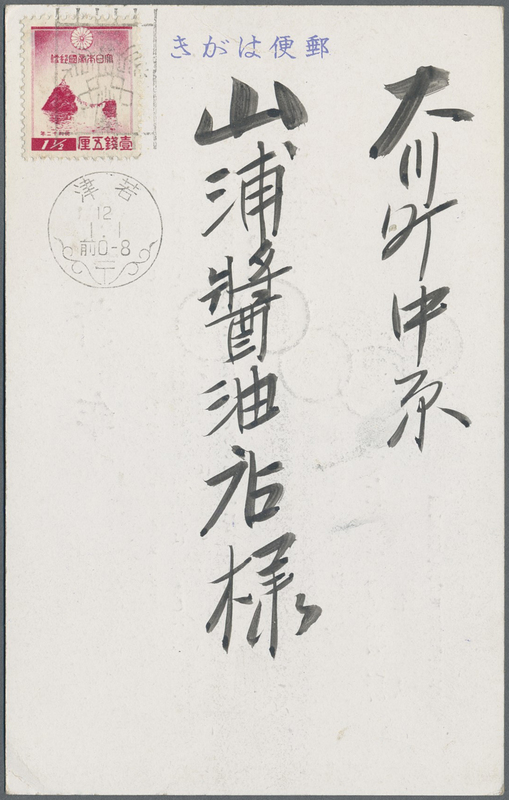 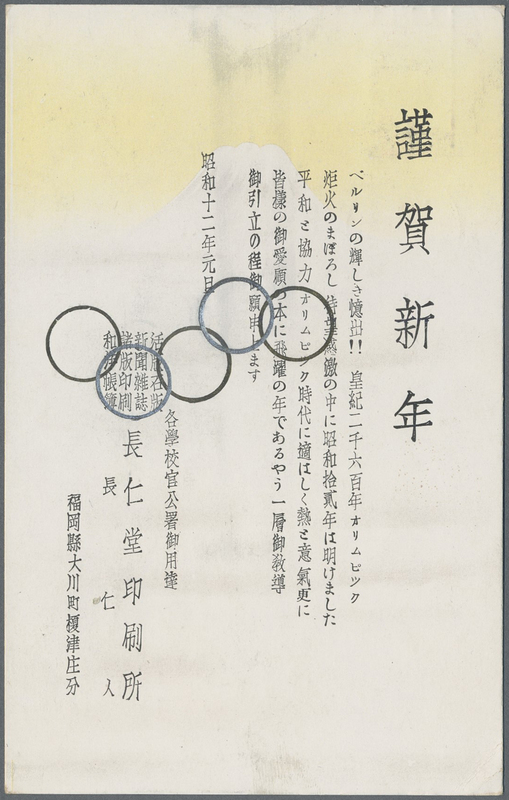 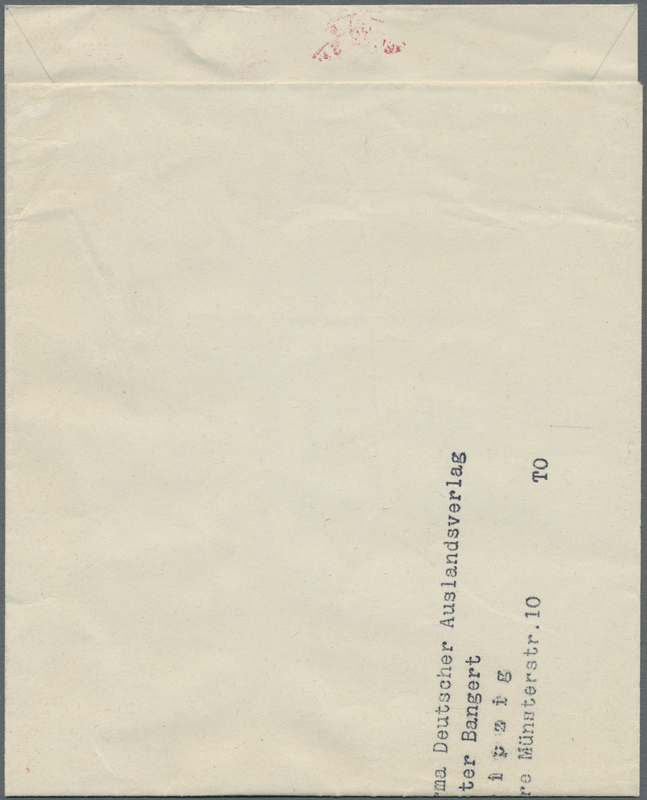 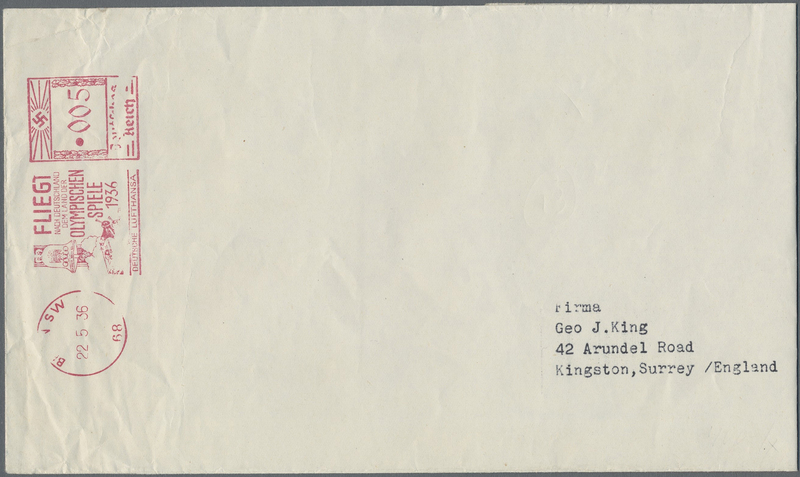 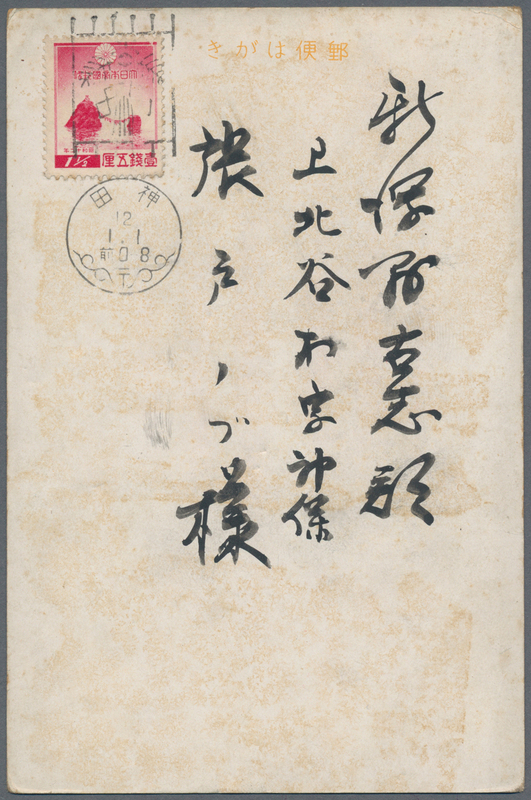 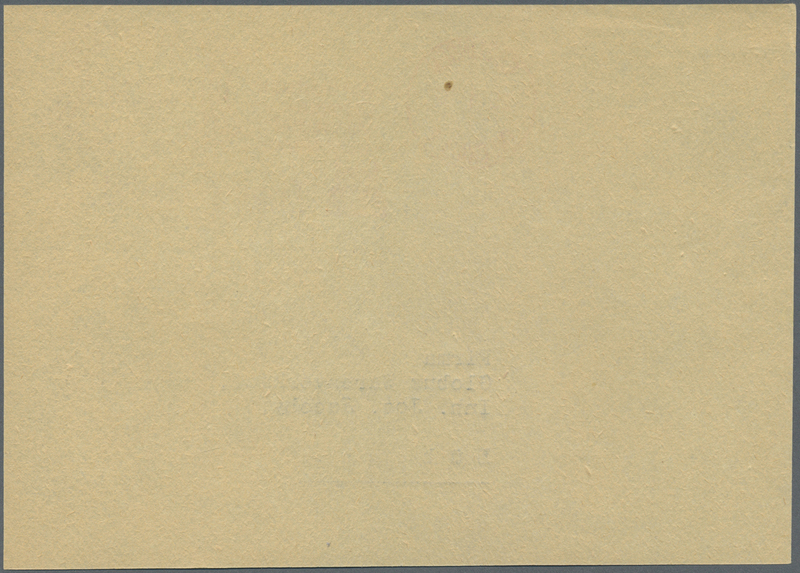 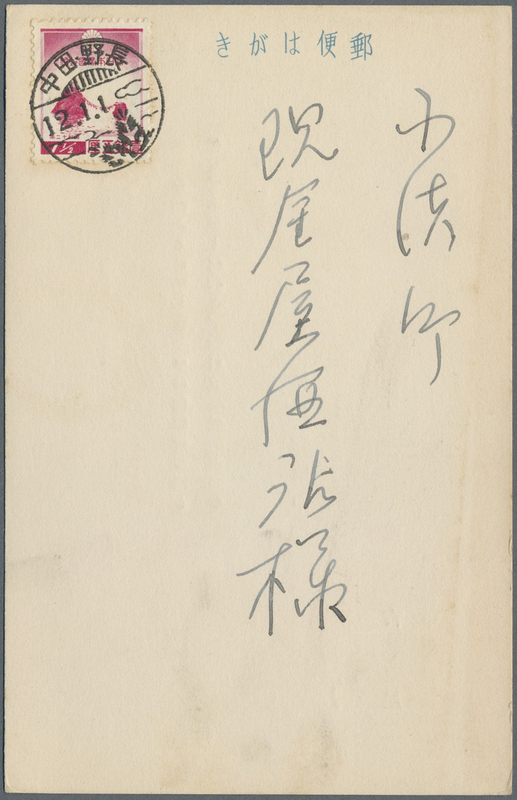 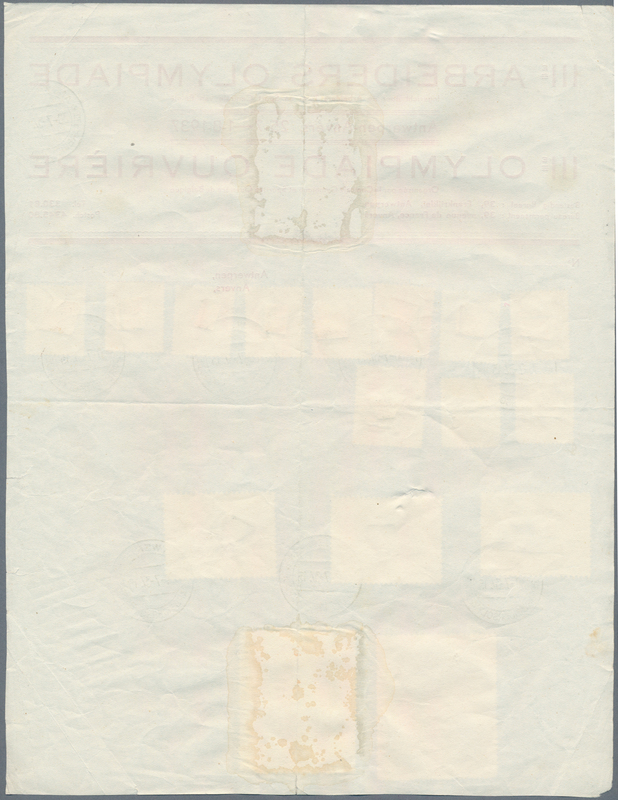 1937, "XII Olympiad Tokyo 1940" official logo NYK envelope, inscription hand-deleted by red crayon , w. Showa white-paper/1st Show mixed five-colour franking tied clear "TATUTA-MARU SEAPOST 14.9.38" to Leonia/NJ., USA. 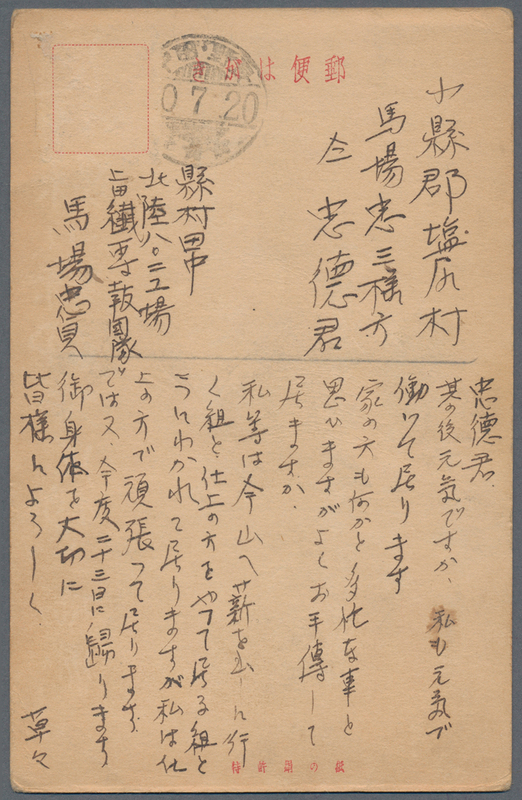 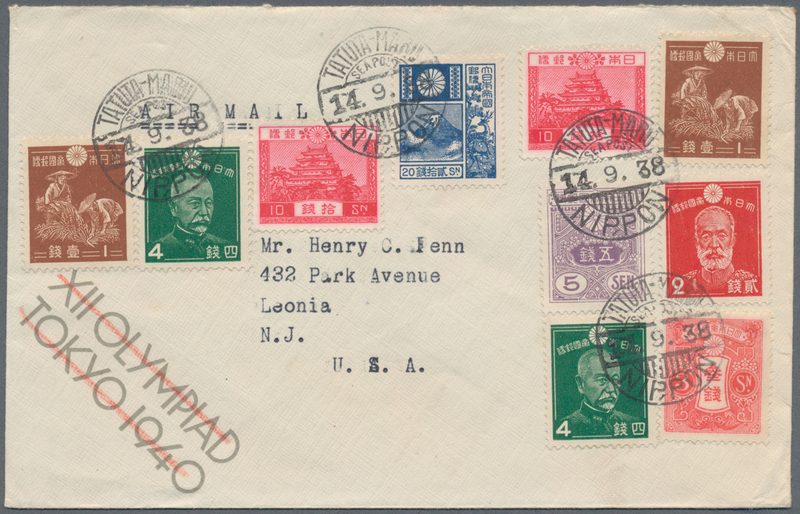 10470 Brief (cover) 257A 1937, "XII Olympiad Tokyo 1940" official NYK envelope w. Admiral Togo 4 sen tied clear "TATUTA MARU SEAPOST 30.6.38" to Tokyo/Japan at the inland tariff SPO-homeland. 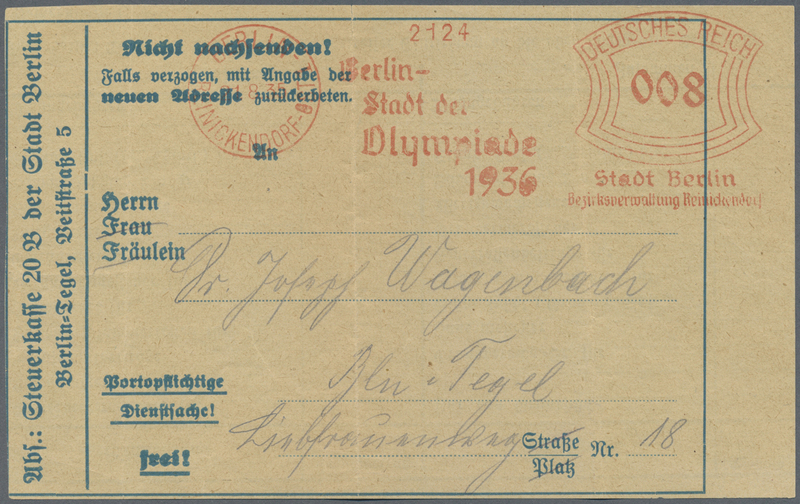 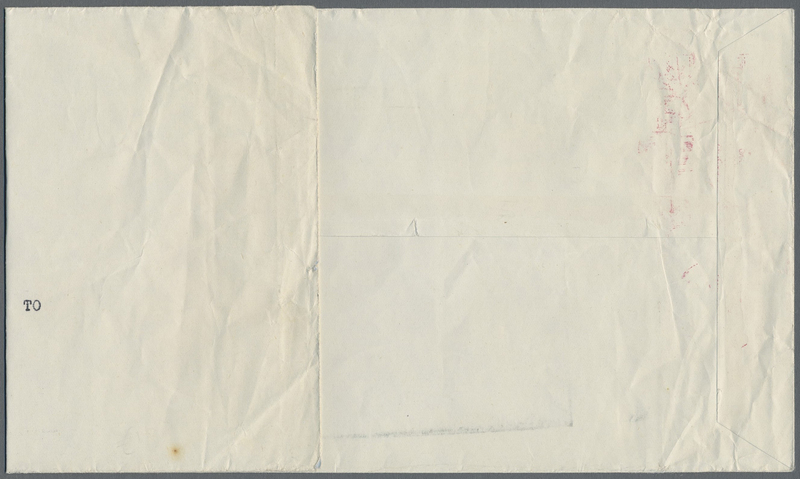 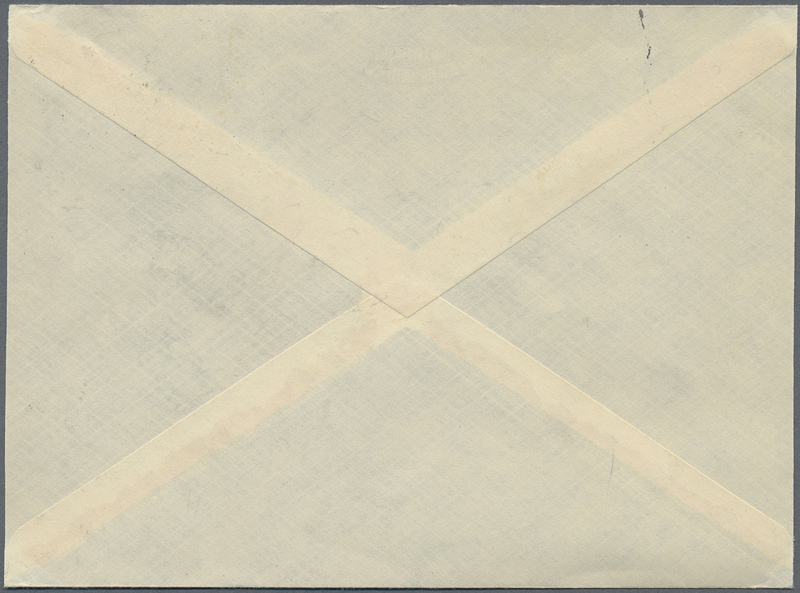 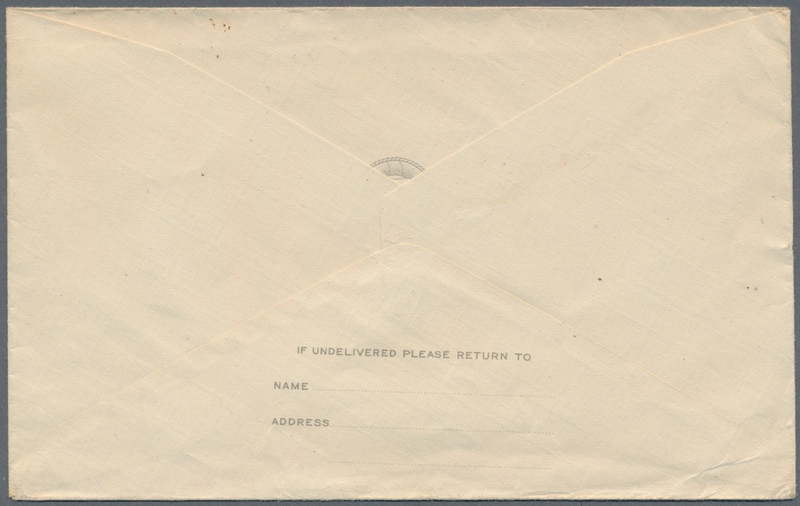 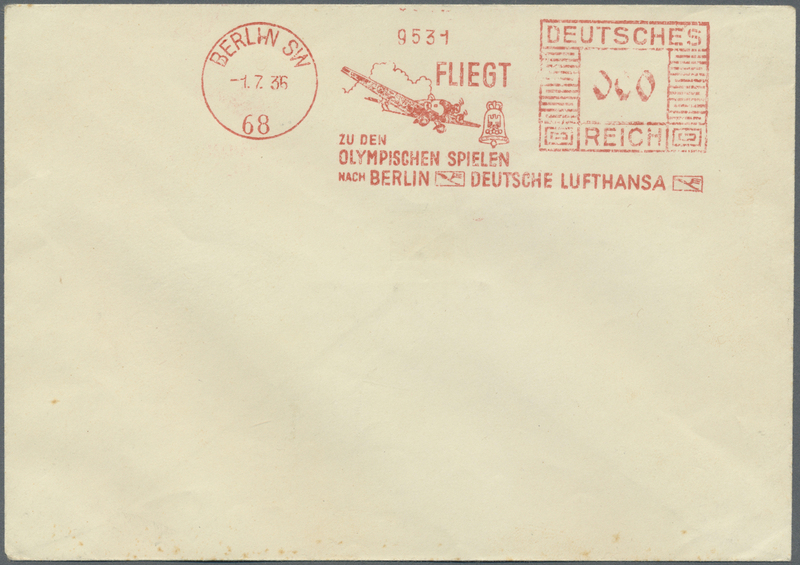 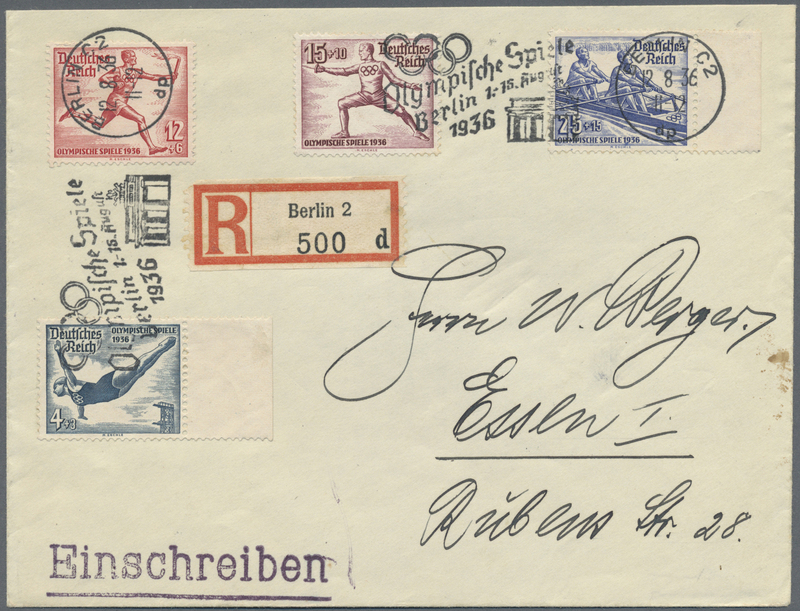 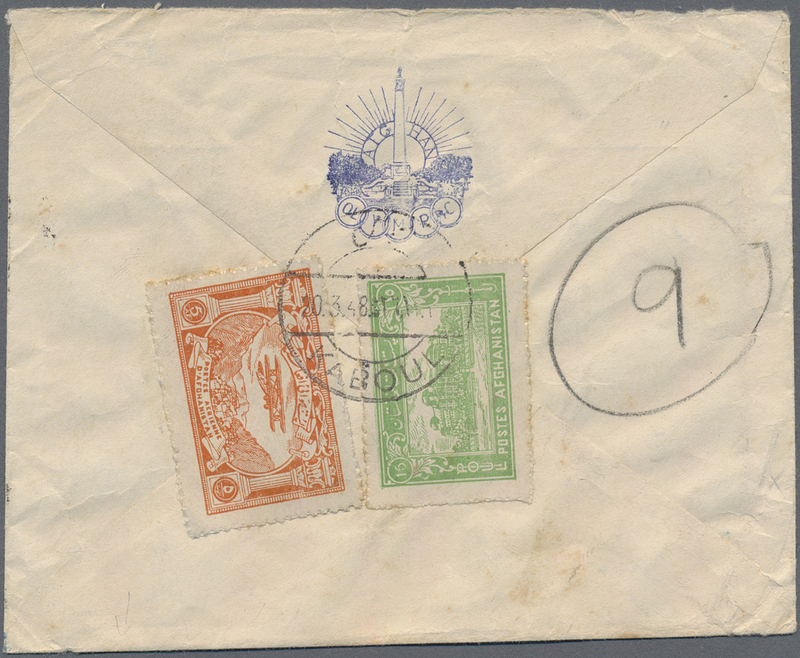 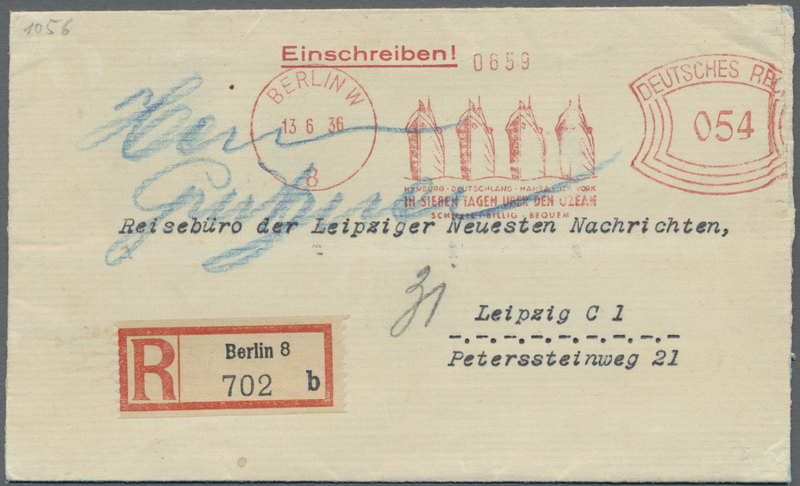 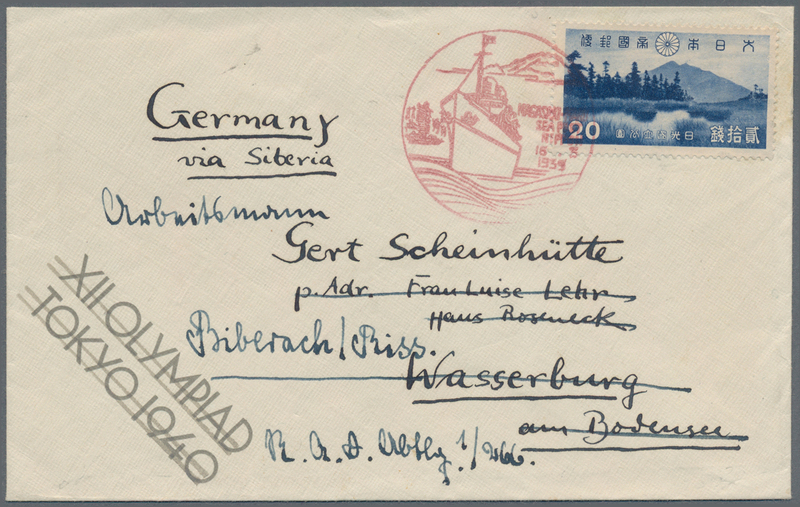 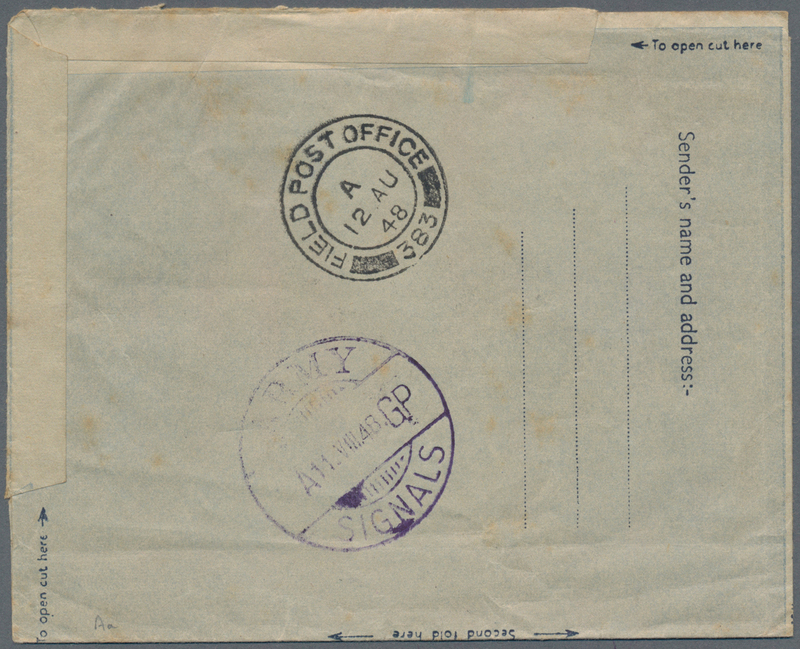 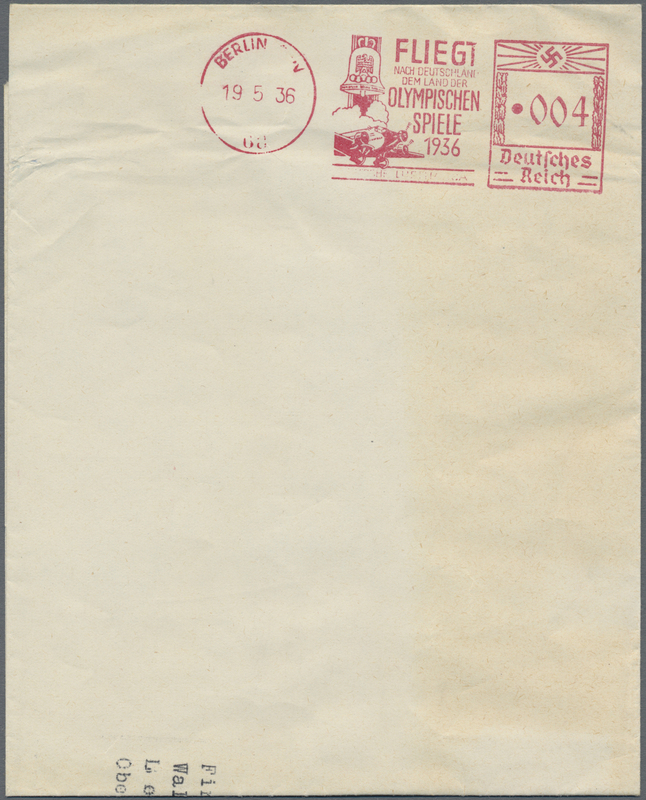 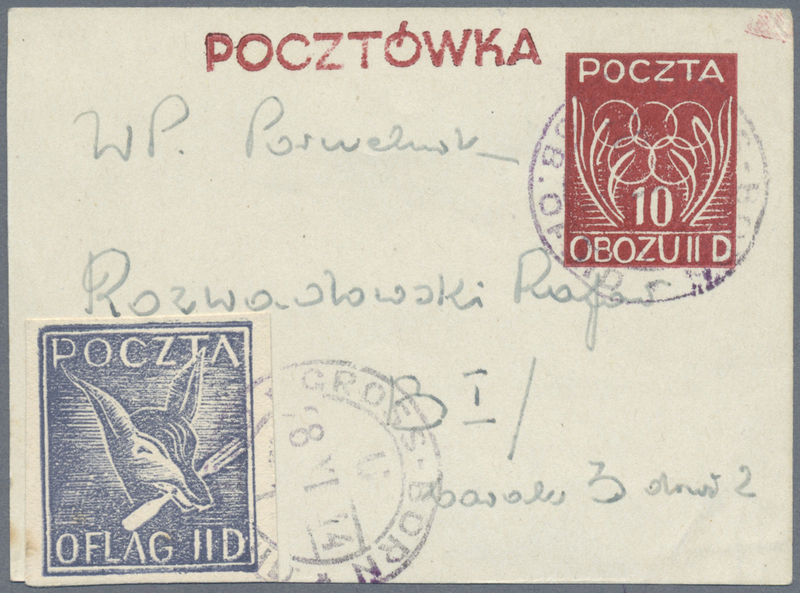 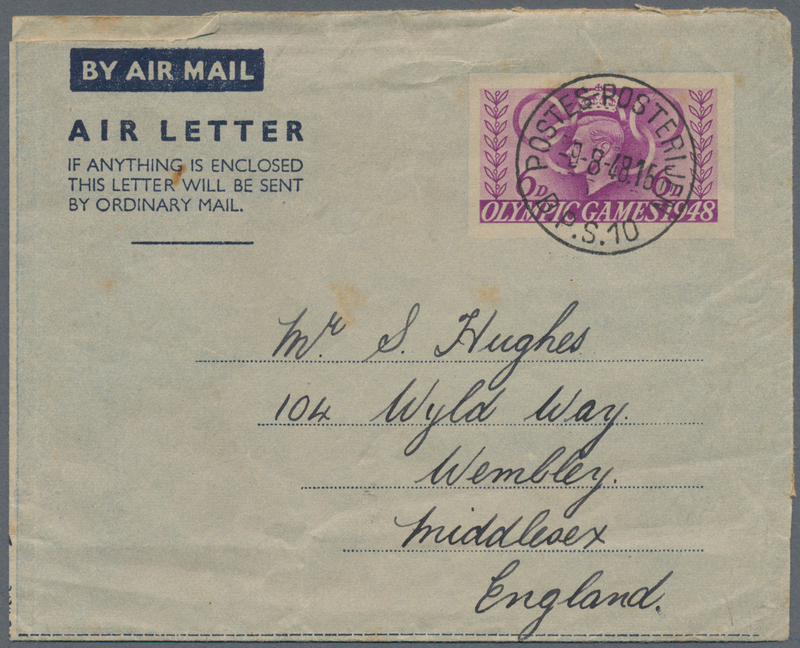 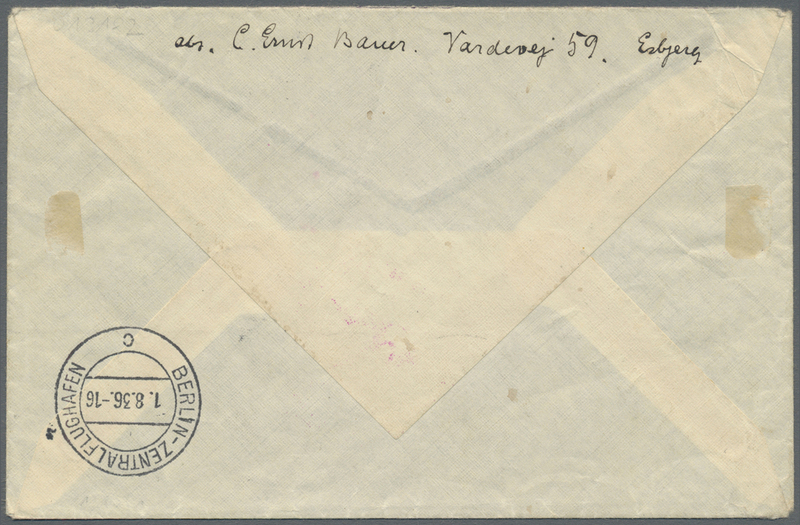 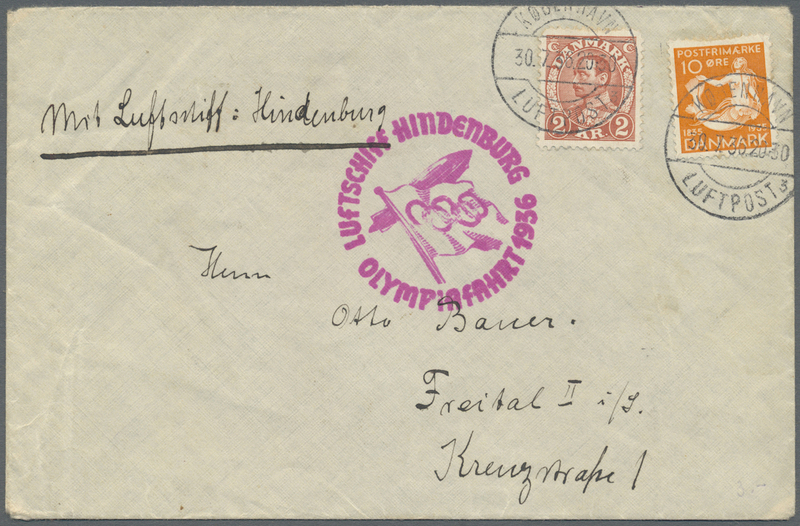 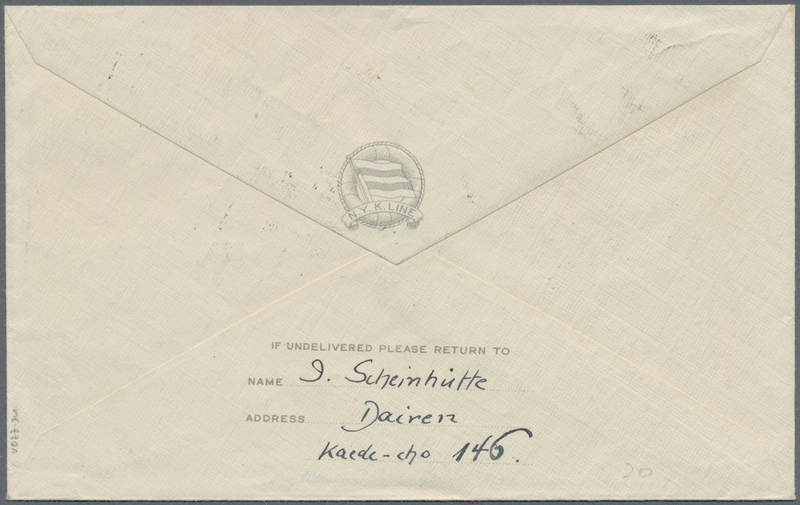 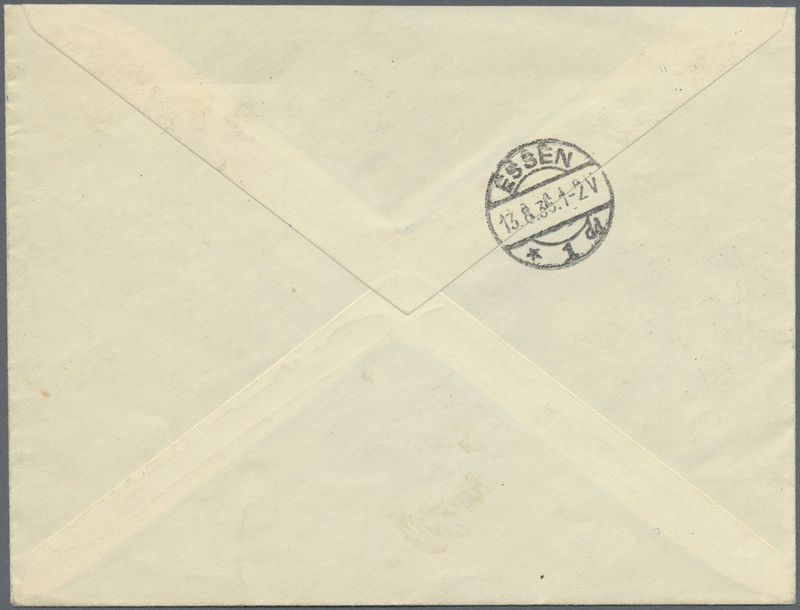 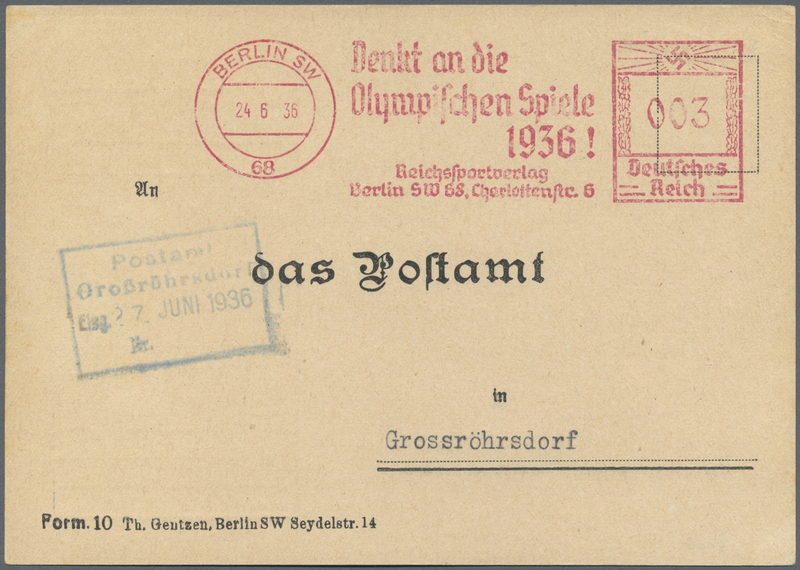 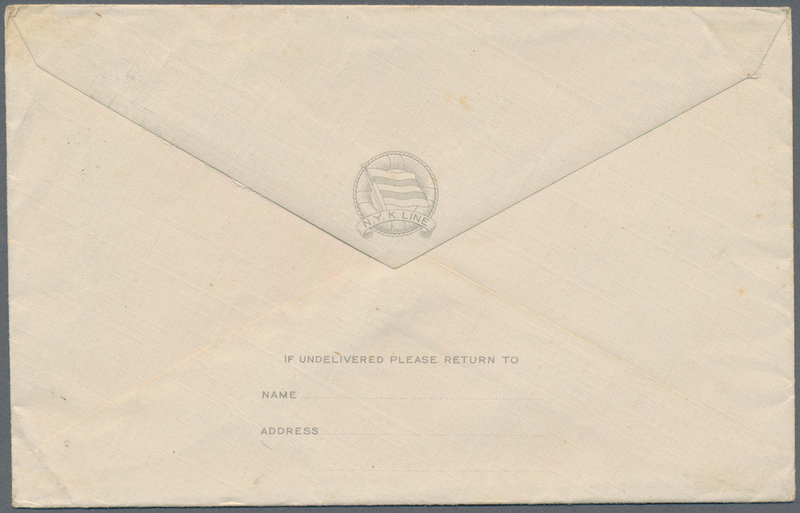 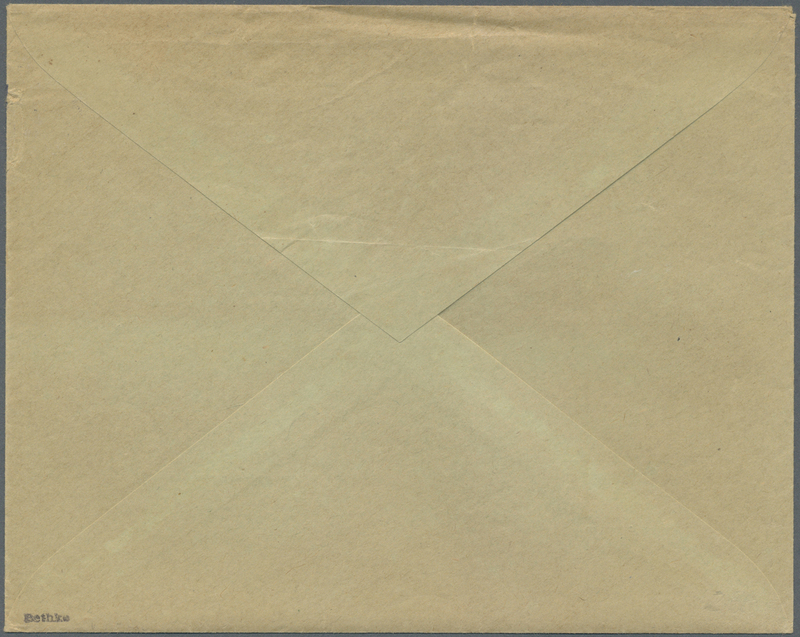 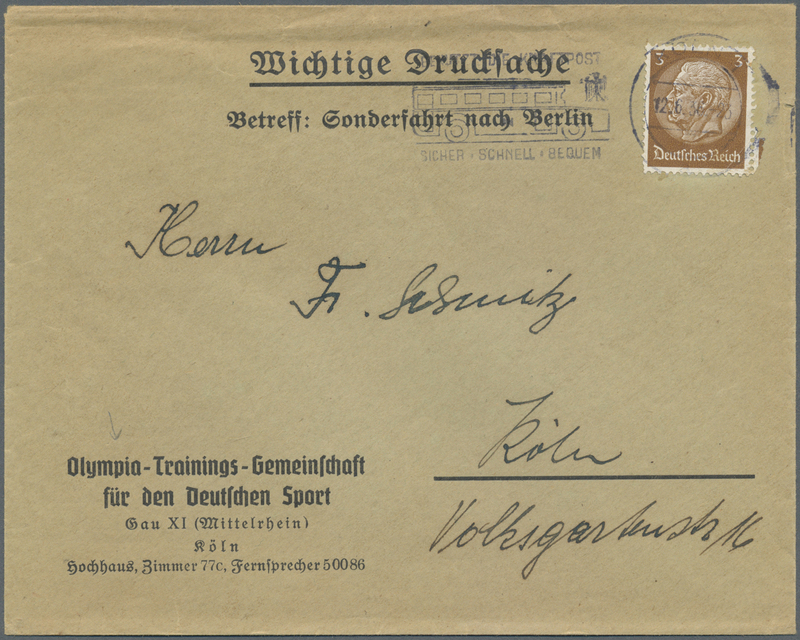 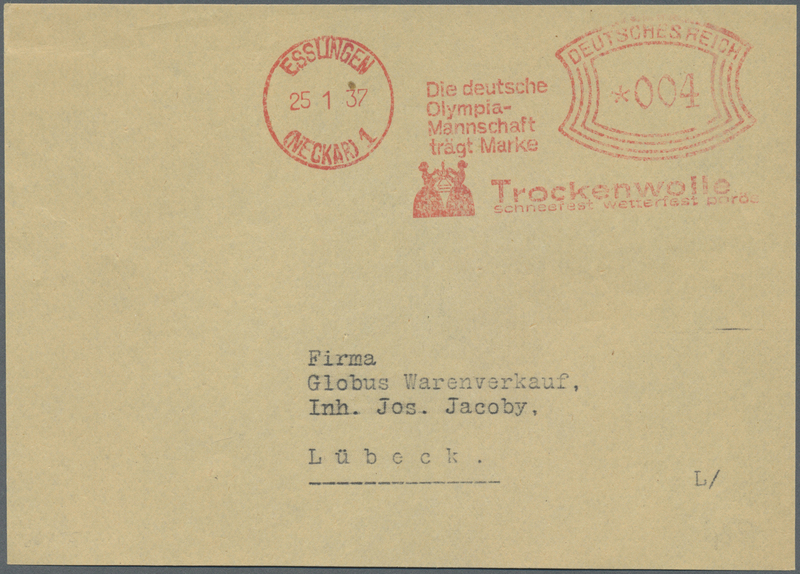 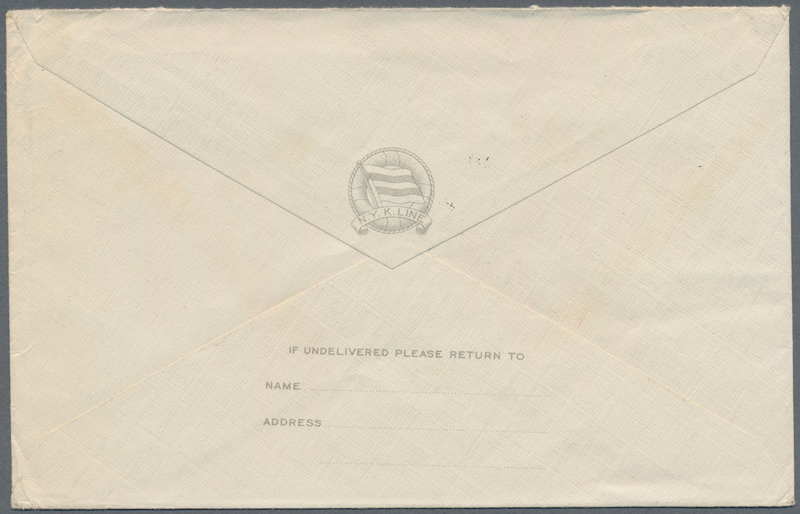 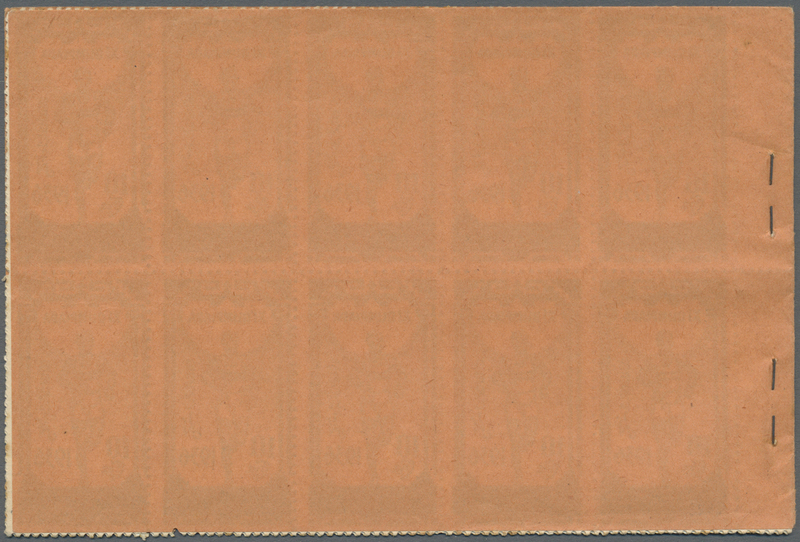 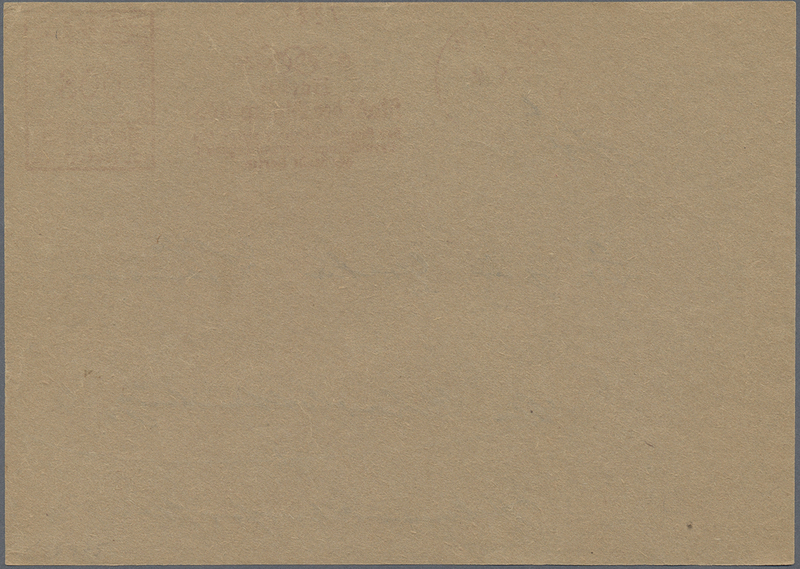 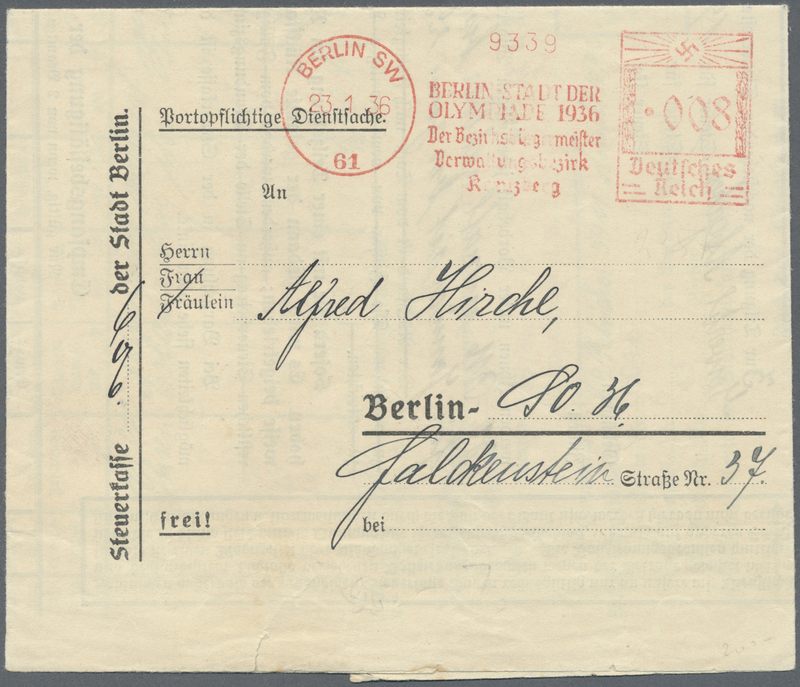 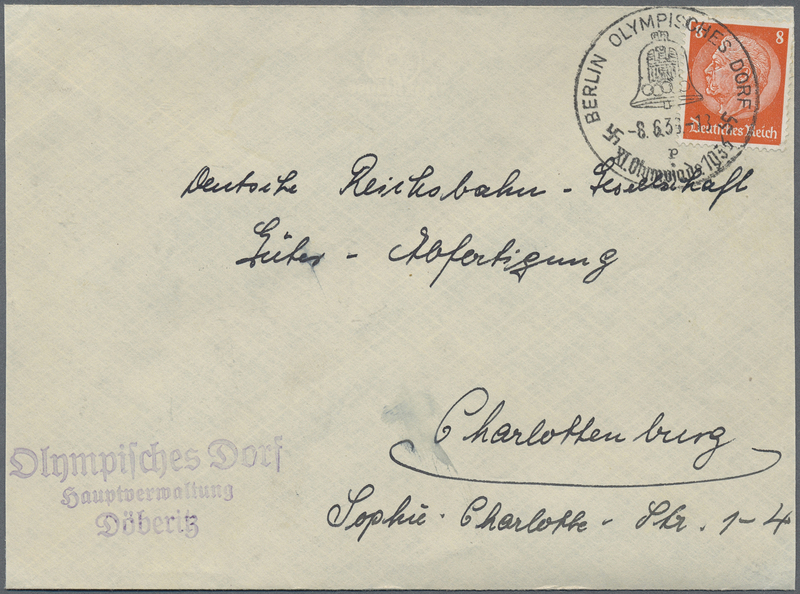 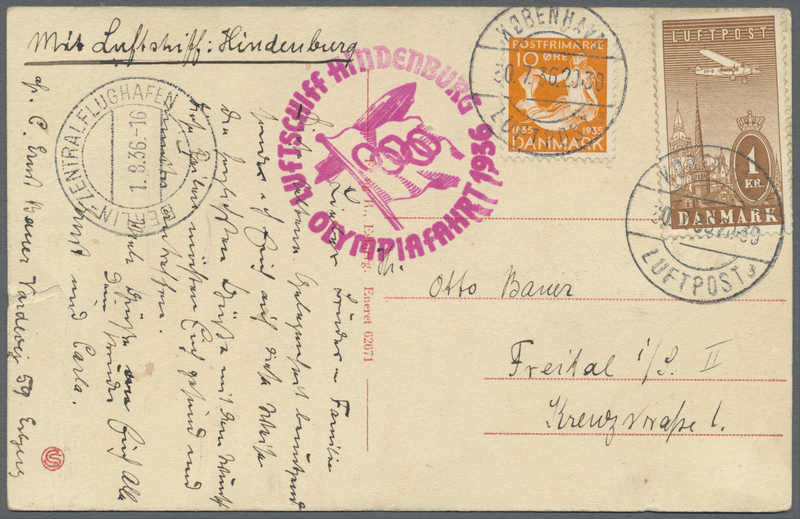 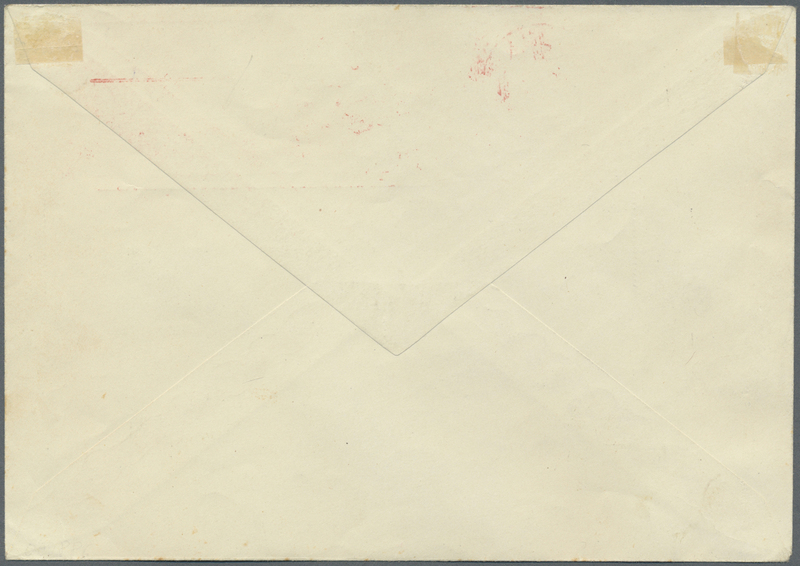 10471 Brief (cover) 275 1937, "XII Olympiad Tokyo 1940" (deleted by overprinted double bar) official NYK envelope w. Nikko NP 20 sen tied clear landscape "NAGASAKI MARU 18.3.39" to Germany via Siberia and fwd., sender w. Dairen home address. 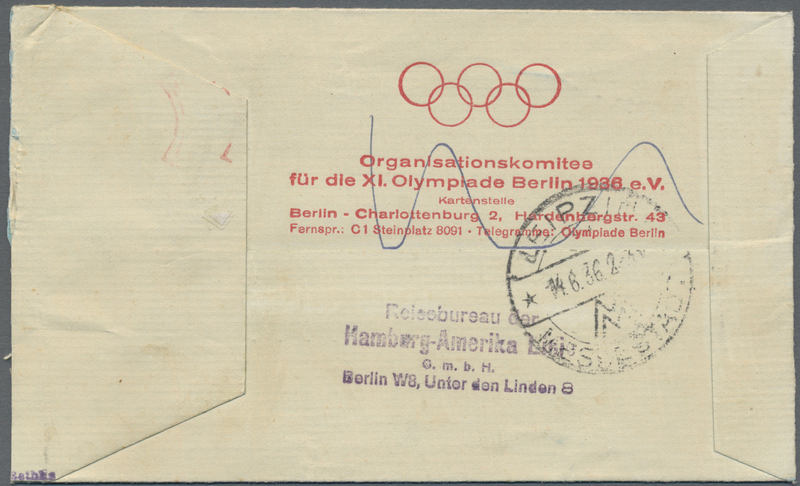 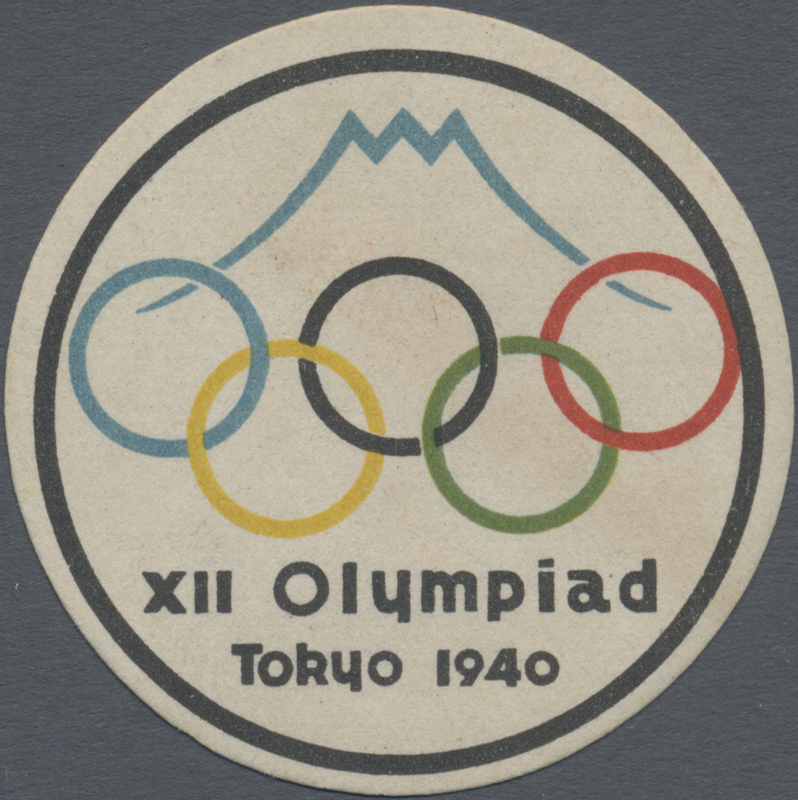 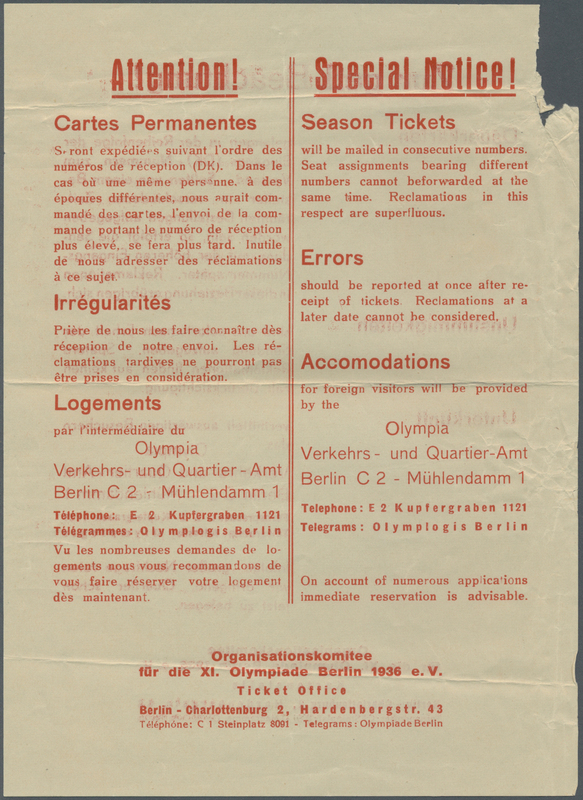 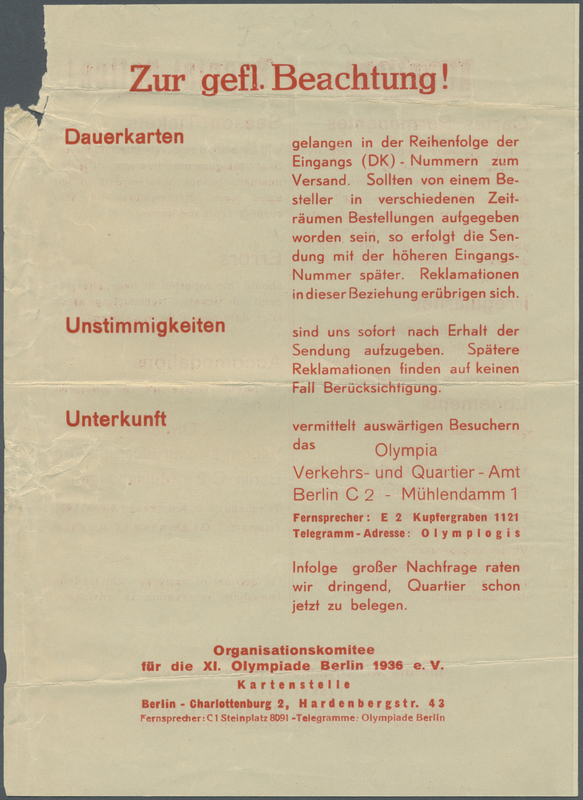 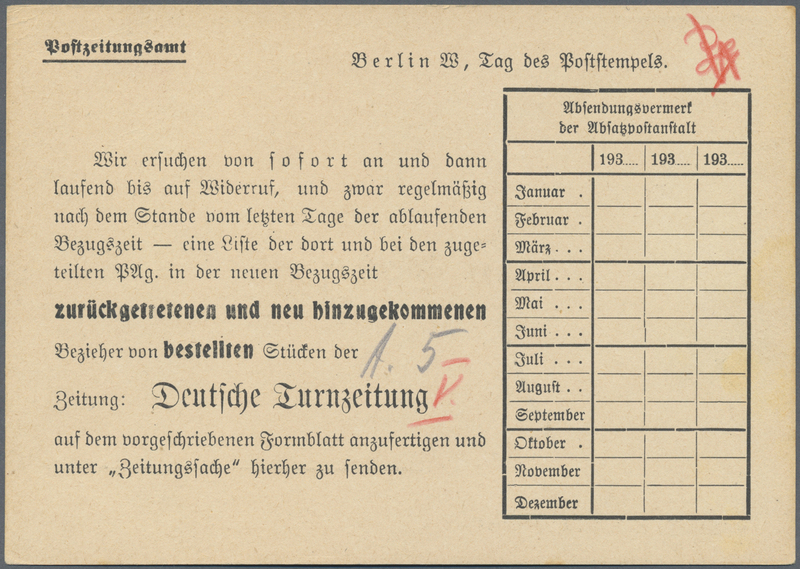 10476 ungebraucht (hinged) * ungebraucht ohne Gummi (unused without gum) (*) 1940, Tokyo Olympic Summer Games, organization committee multicolour official stickers (4): circular (diam. 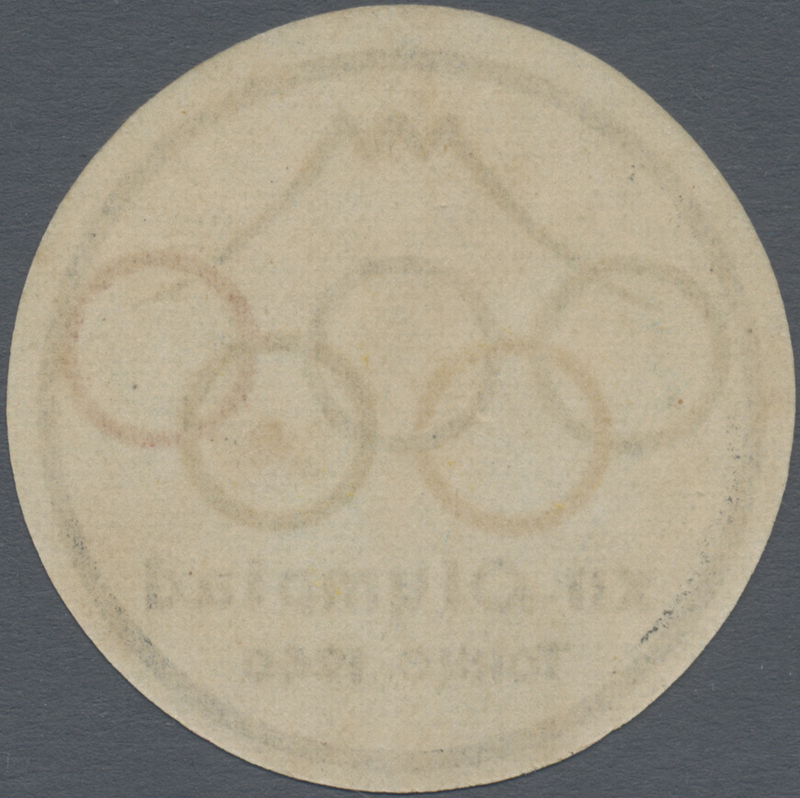 39 mm) showing Mt. 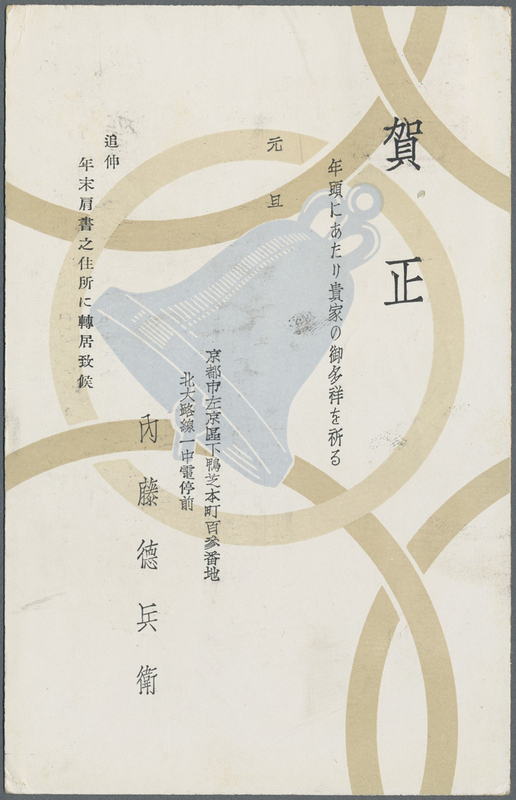 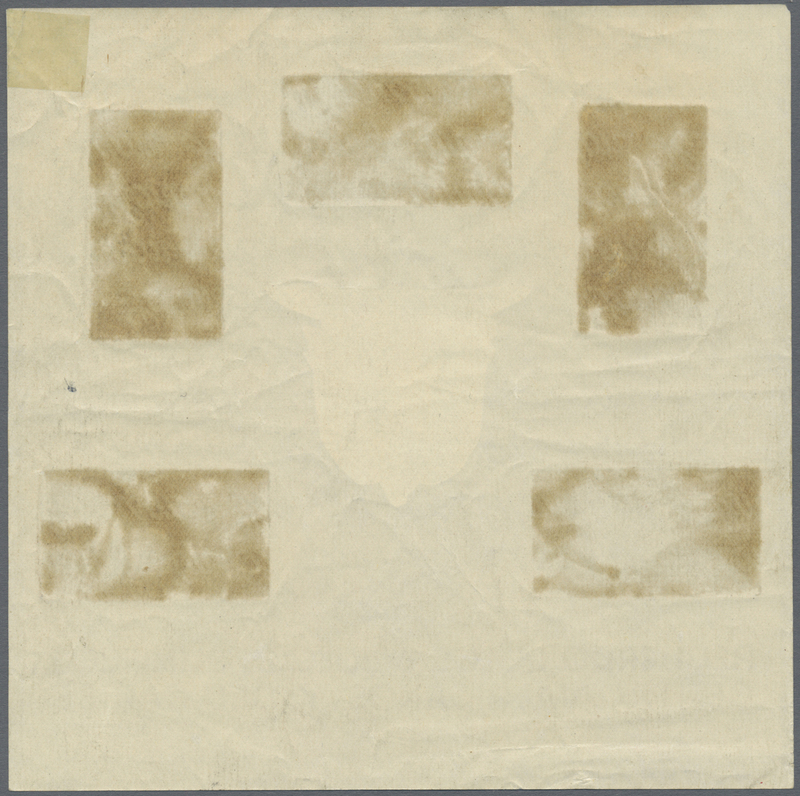 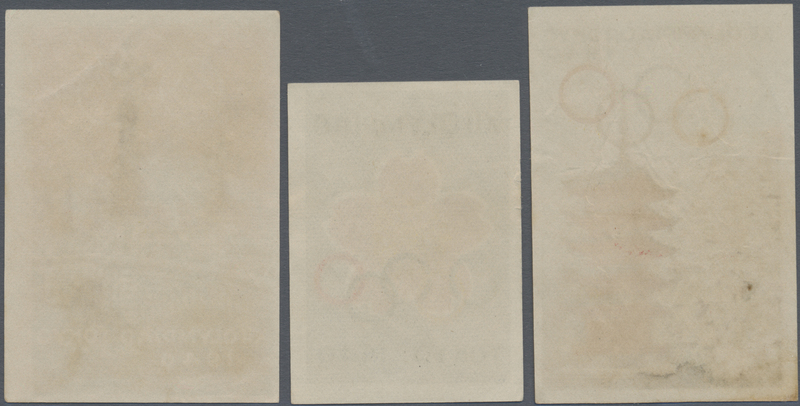 Fuji and five rings, gummed; three rectangular ungummed with pagoda/cherry blossoms, blossom crest, bridge. 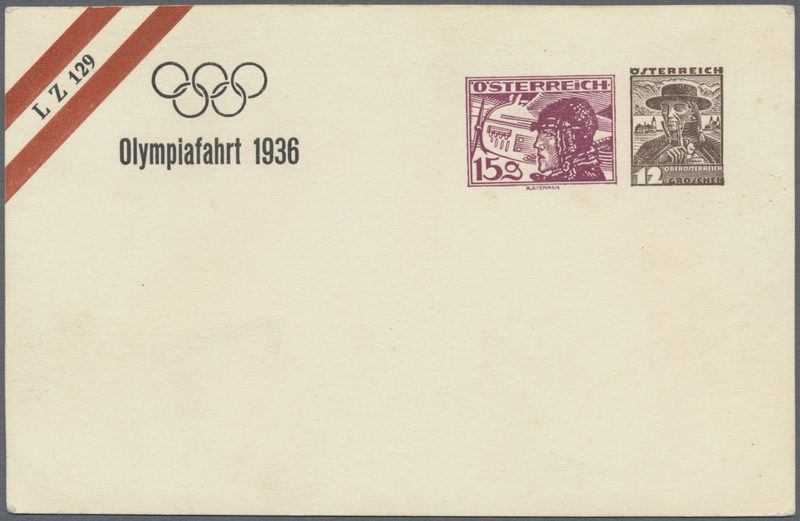 10477 Ansichtskarte (Picture postcard) 1940, Sapporo Olympic Winter Games, three used cards with respective illustrations showing olympic rings and ski sportsmen, rare. 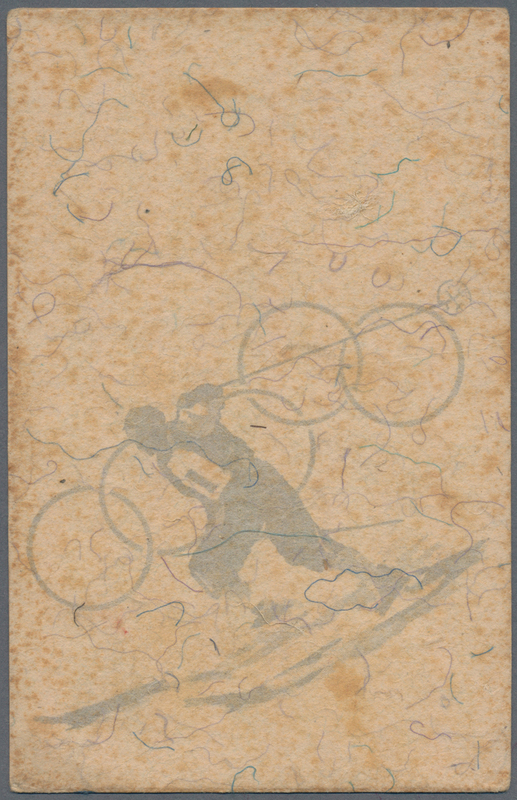 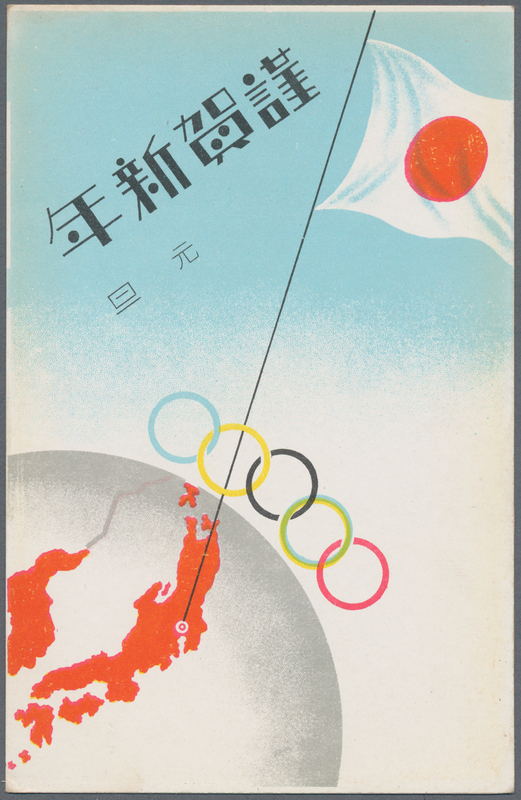 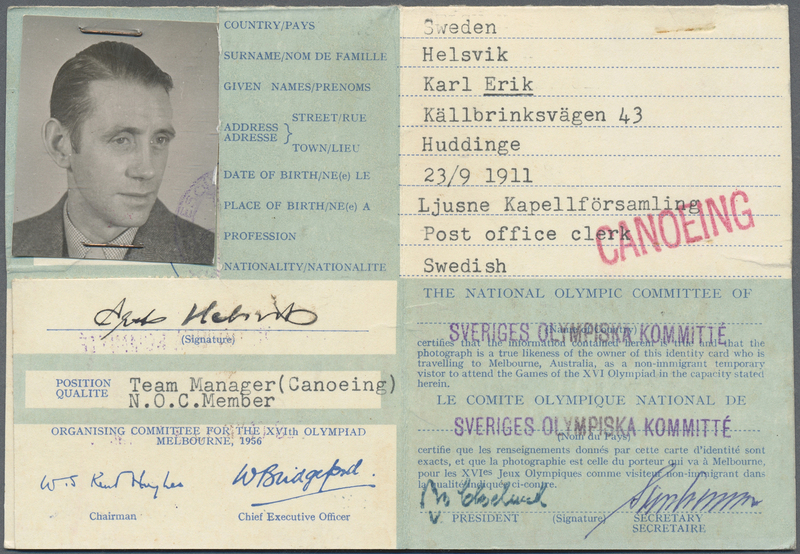 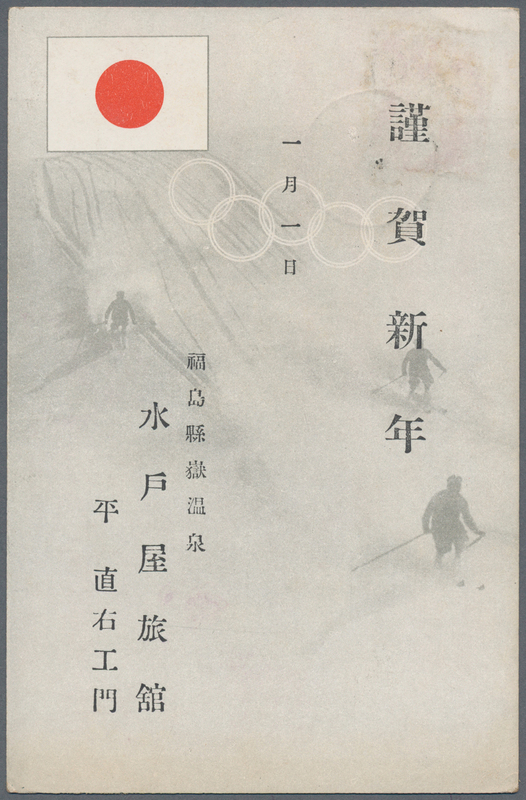 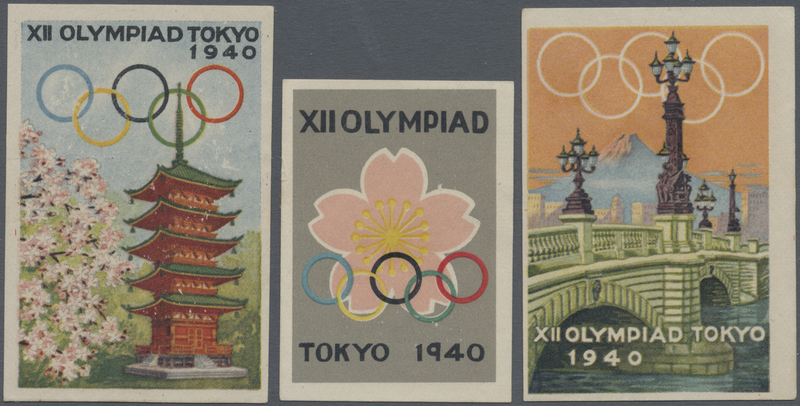 10478 Ansichtskarte (Picture postcard) 1940, Tokyo Olympic Summer Games, four mint new years cards with respective colour illustrations showing olympic rings and sportspeople, laurel and map, ennumerated "o1"-"o4" (o = orimpikku) clean condition. 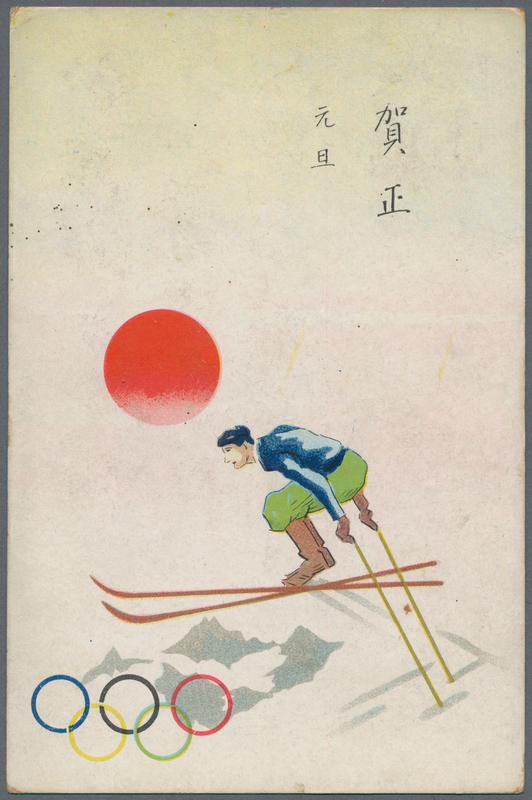 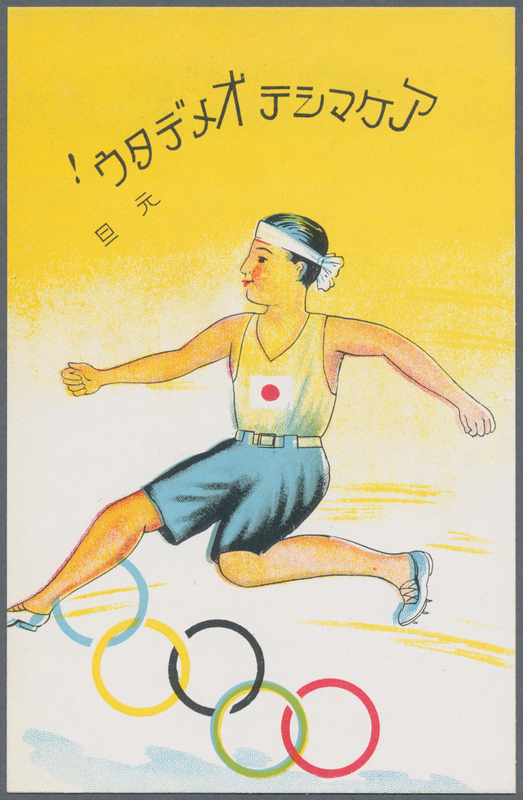 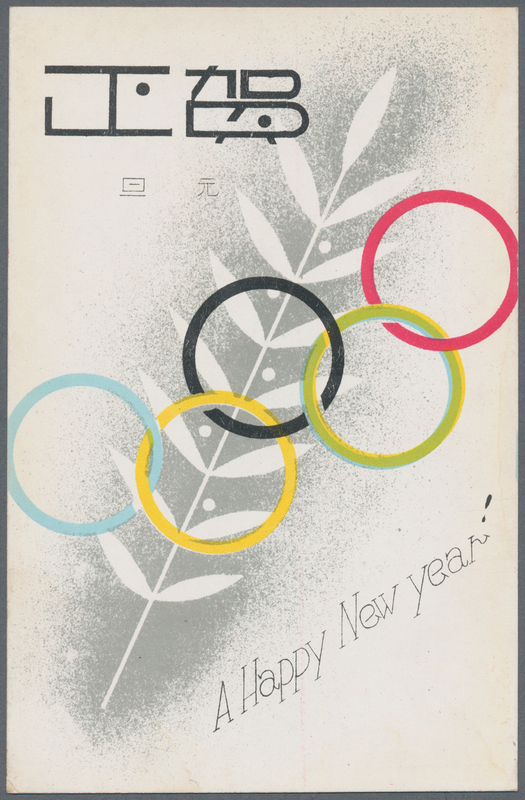 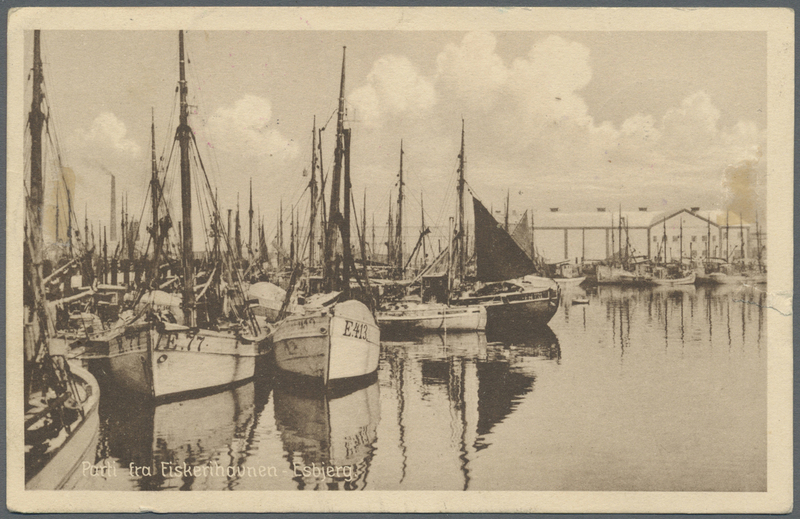 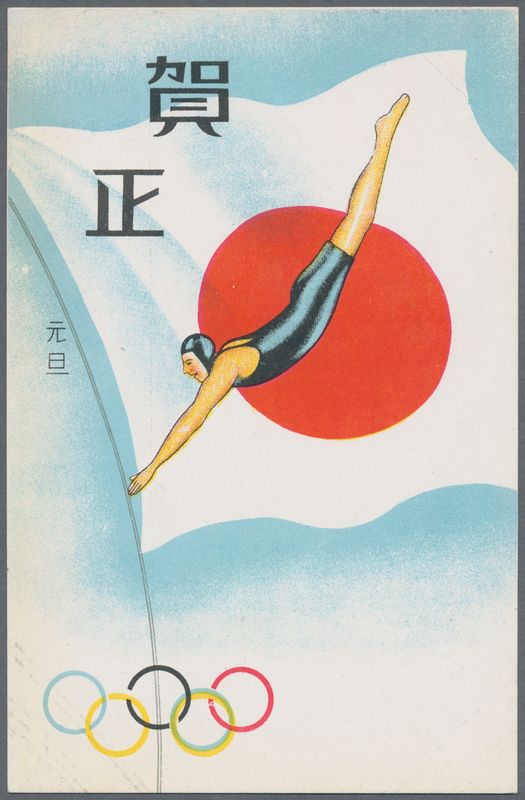 10479 Ansichtskarte (Picture postcard) 1940, Tokyo Olympc Summer Games, four new year cards used Jan. 1. 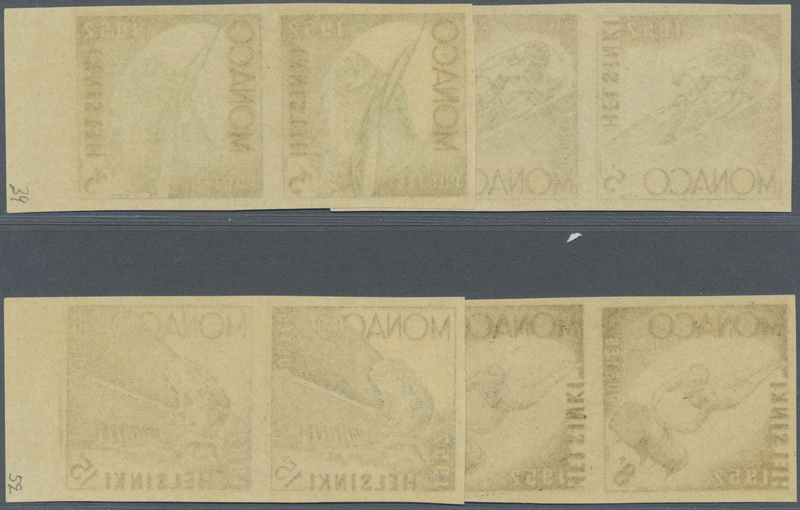 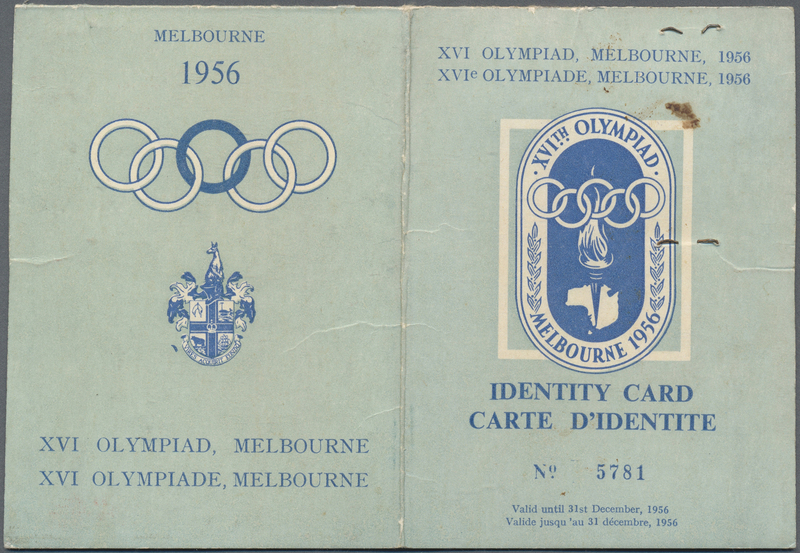 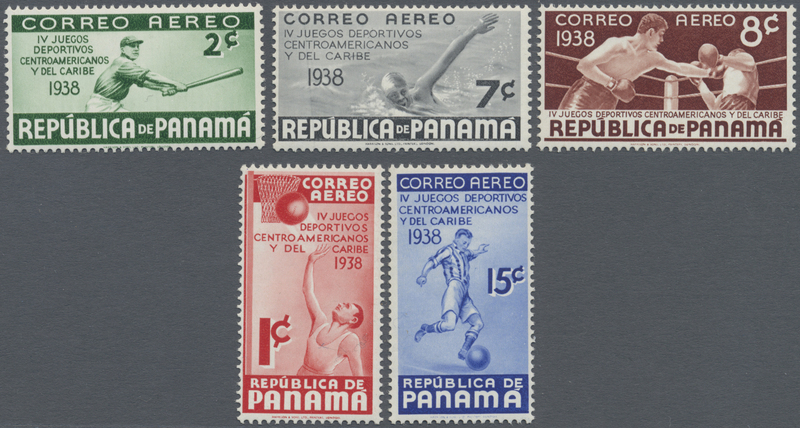 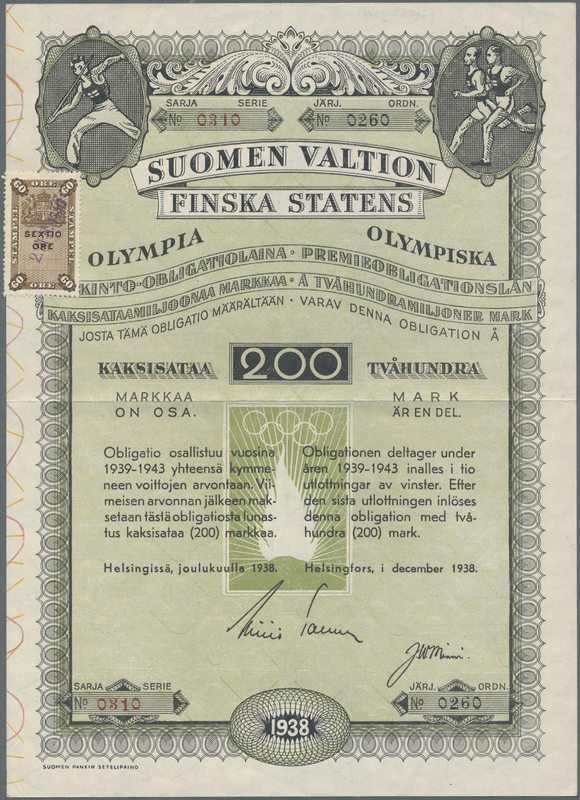 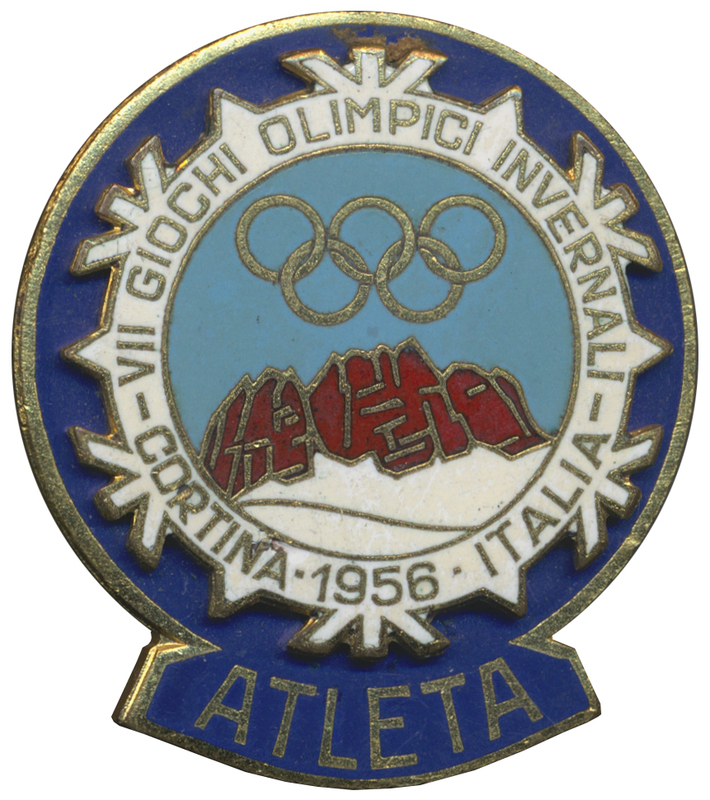 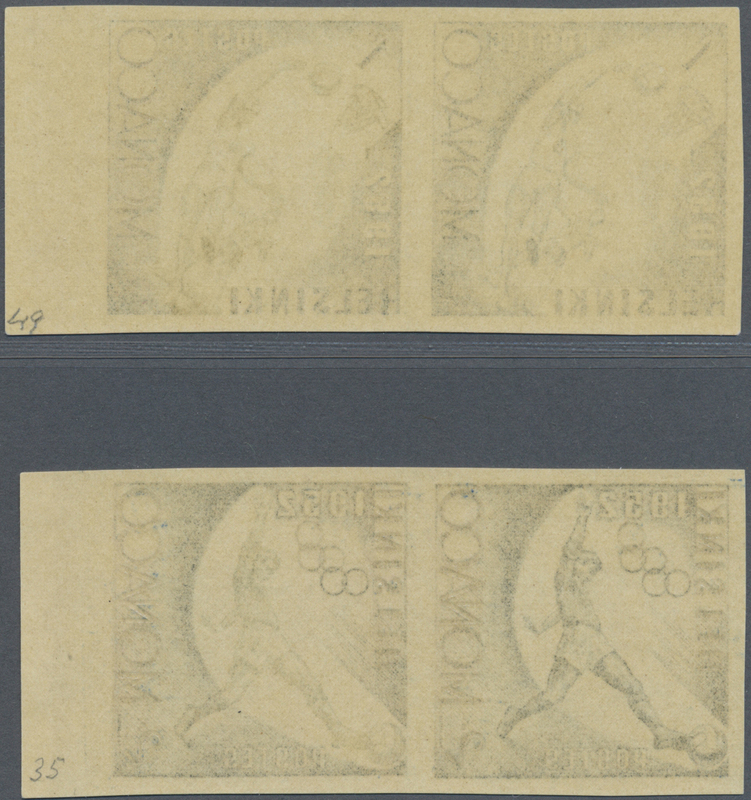 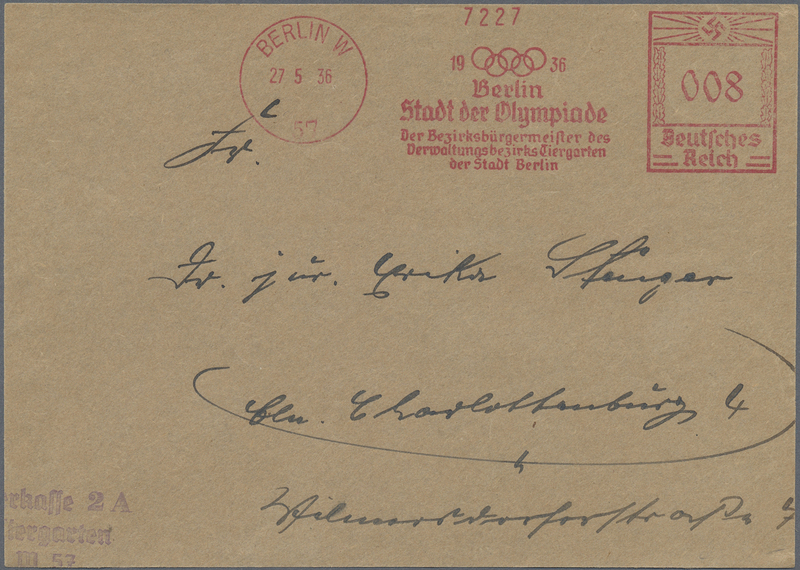 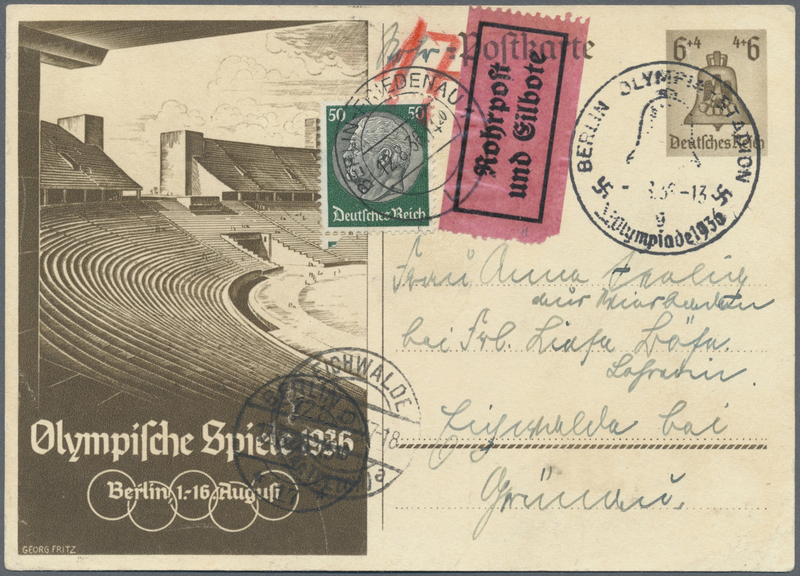 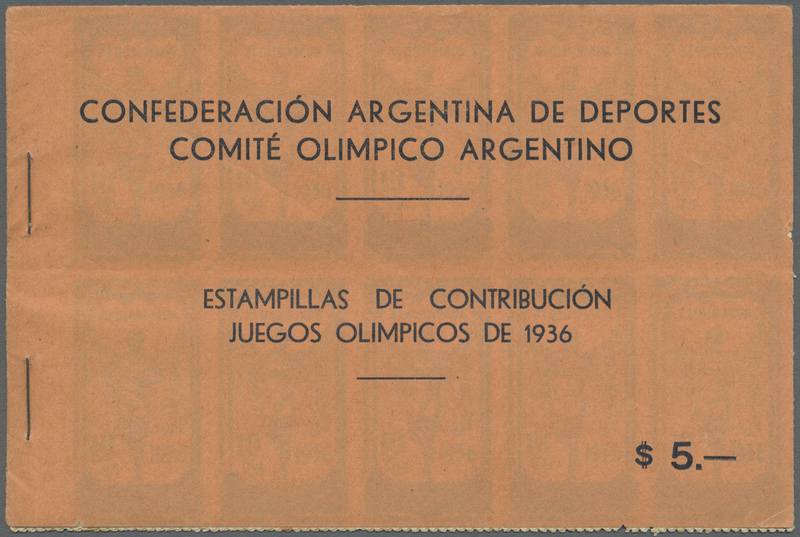 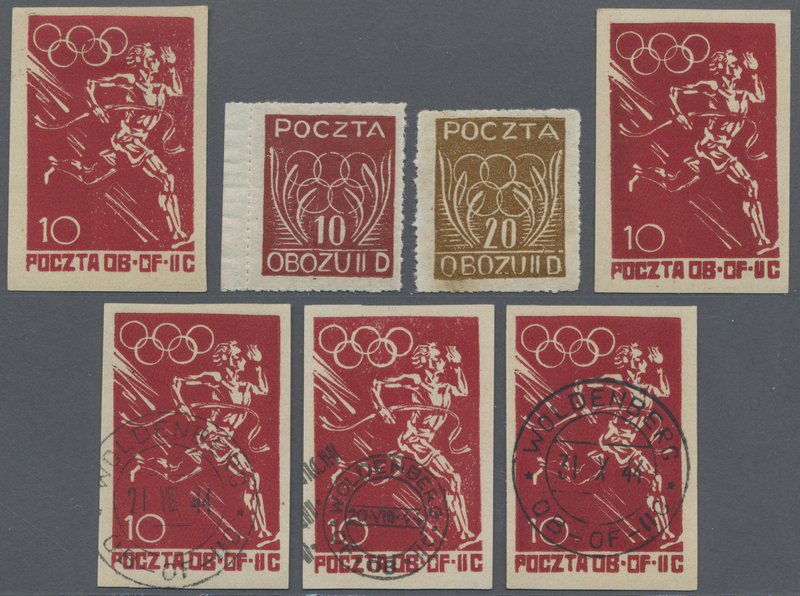 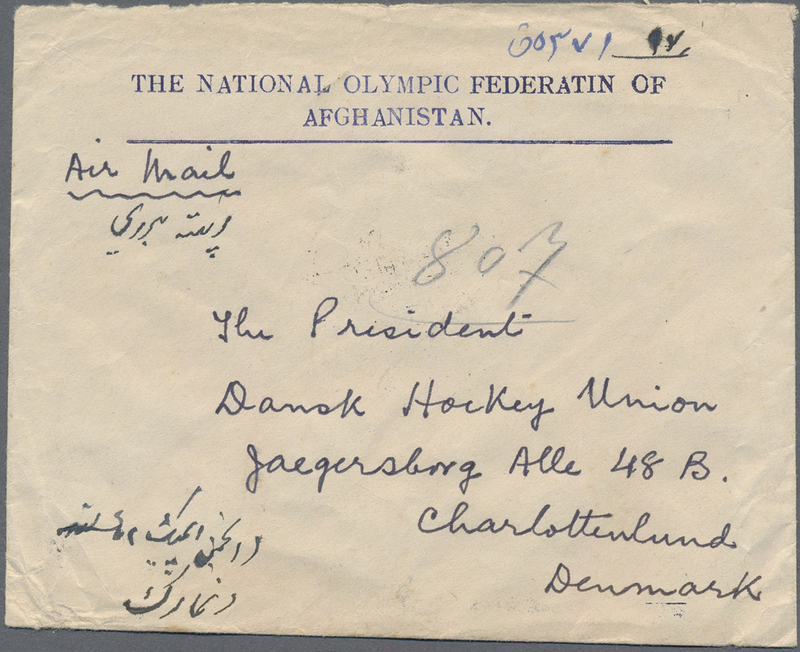 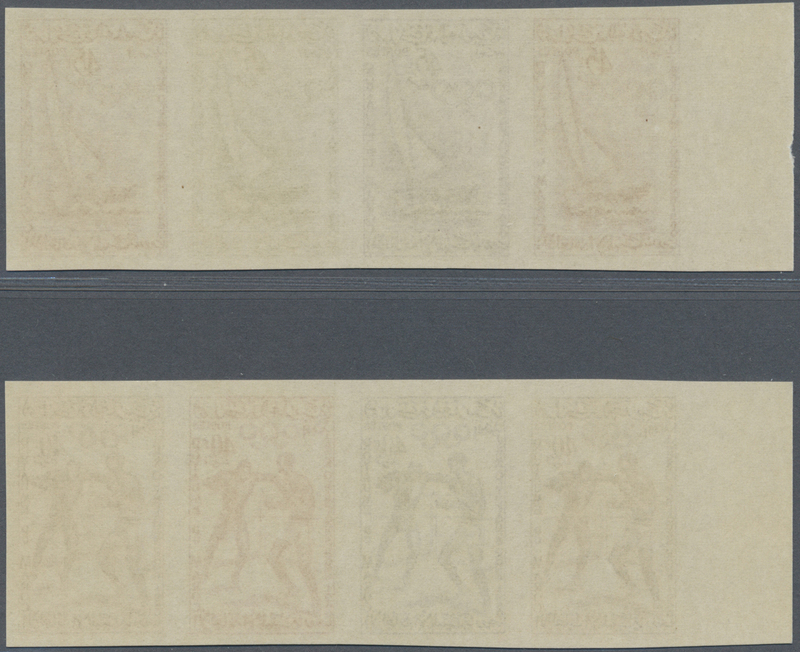 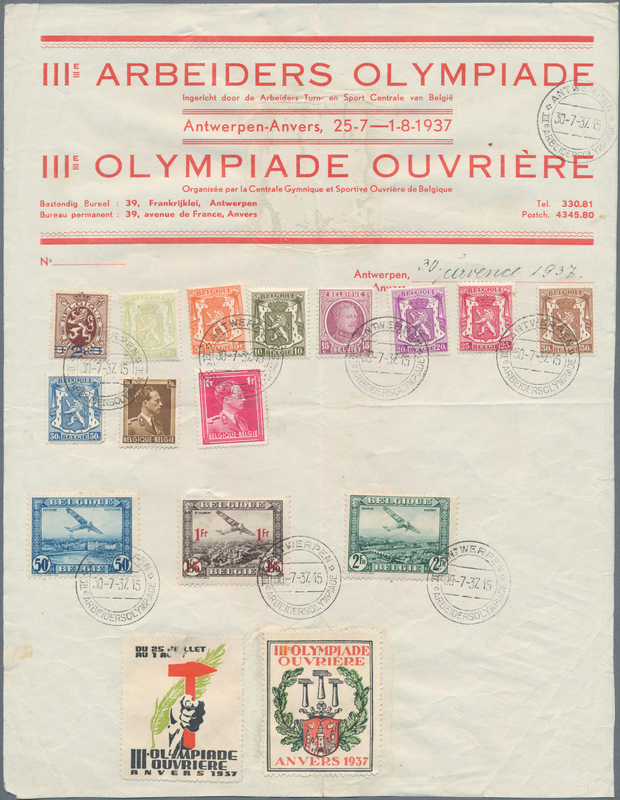 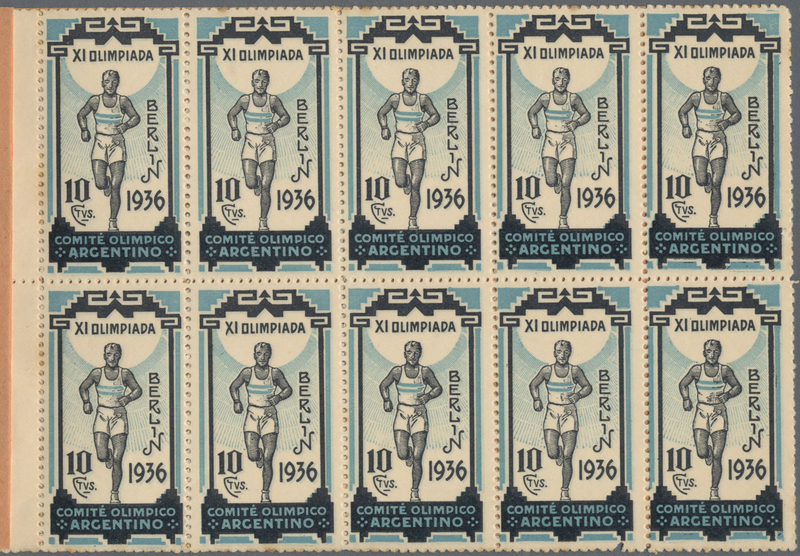 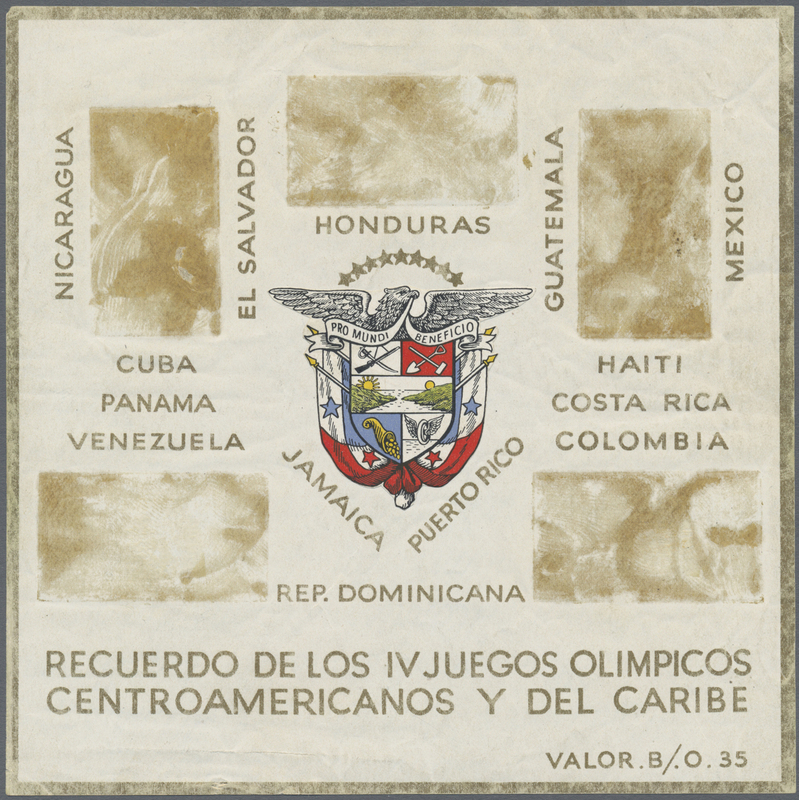 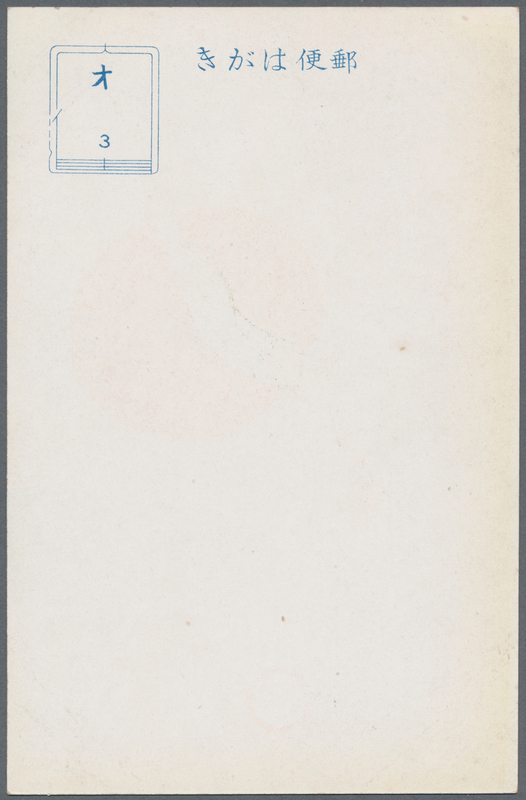 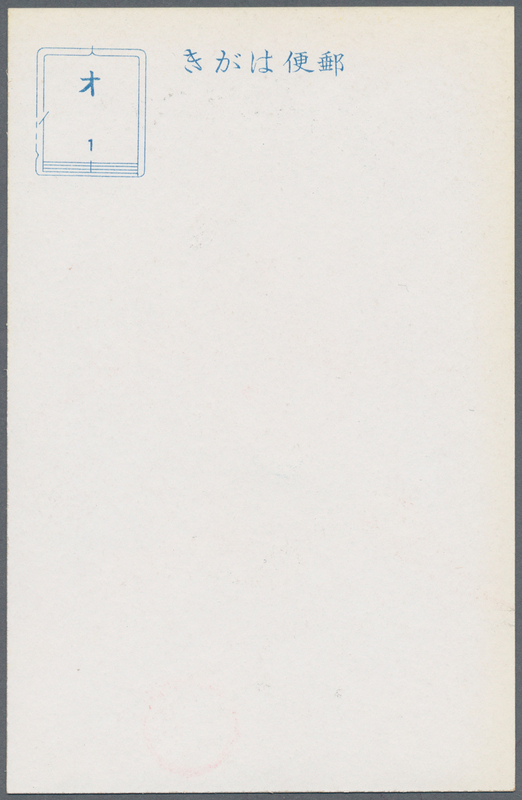 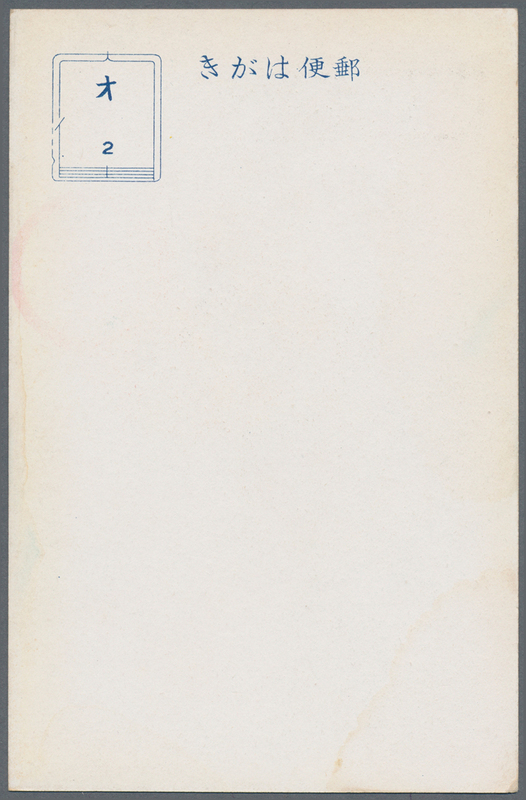 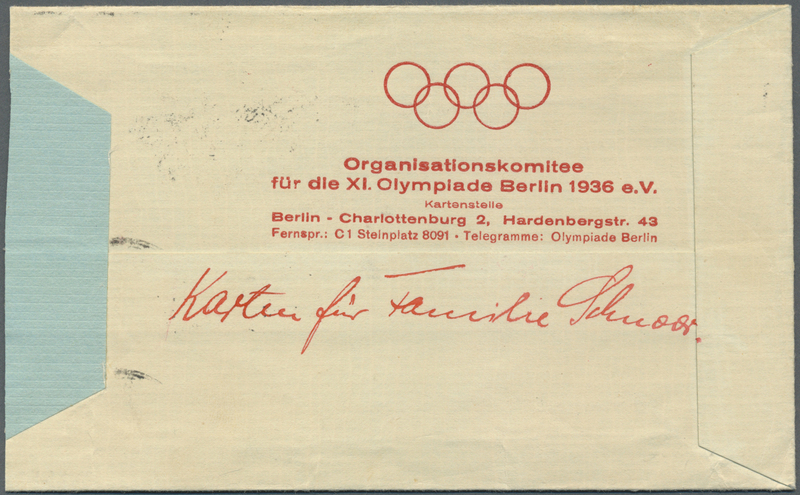 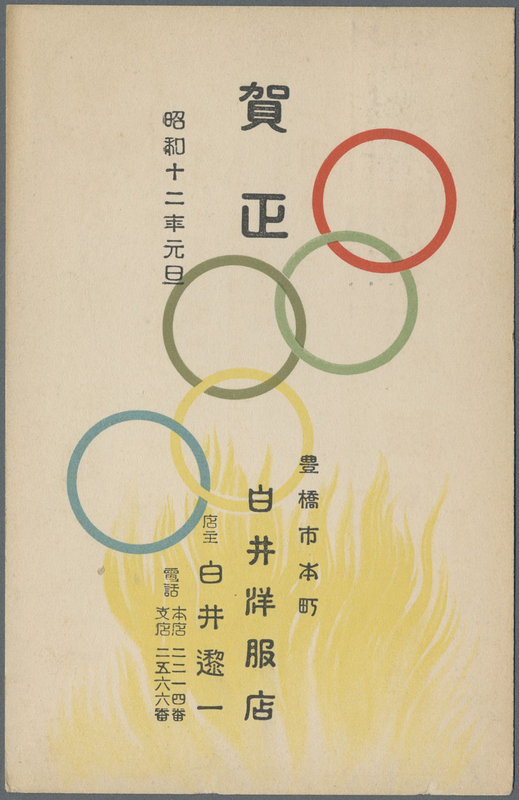 1937 with respective illustrations all showing olympic rings, scarce. 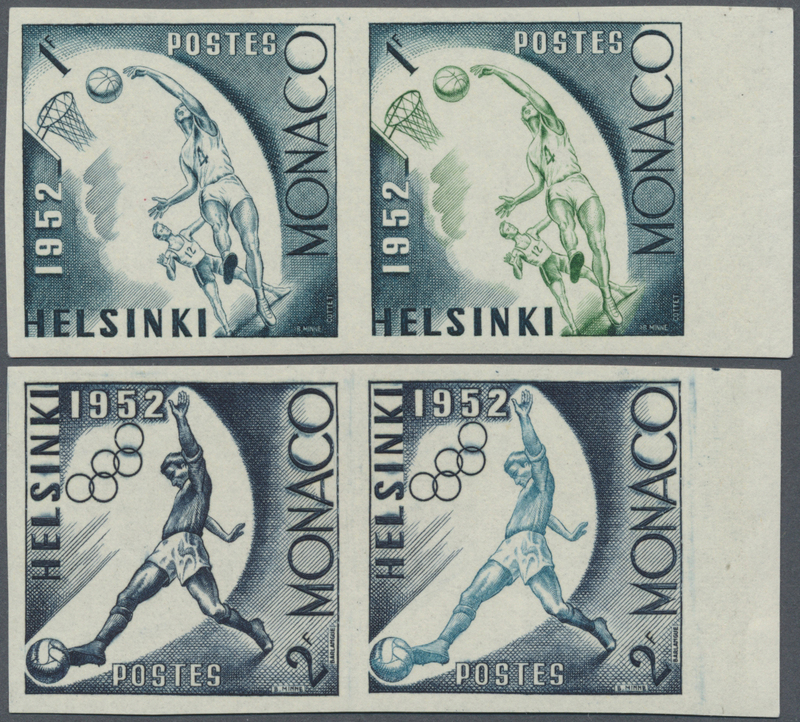 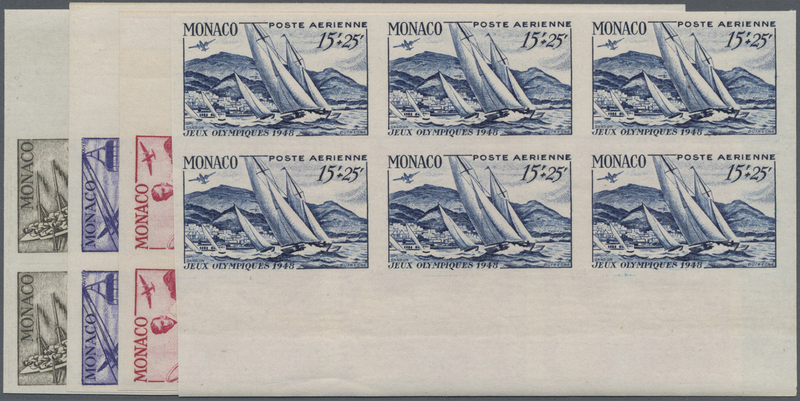 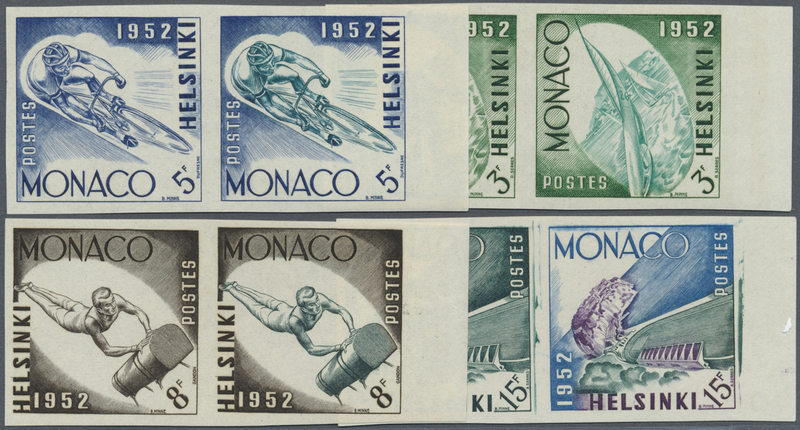 10486 postfrisch (never hinged) ** 1952, Olympia Helsinki 1 F - 15 F complete set in three IMPERFORATED colour proofs each, totally 18 different values mint NH, scarce ! 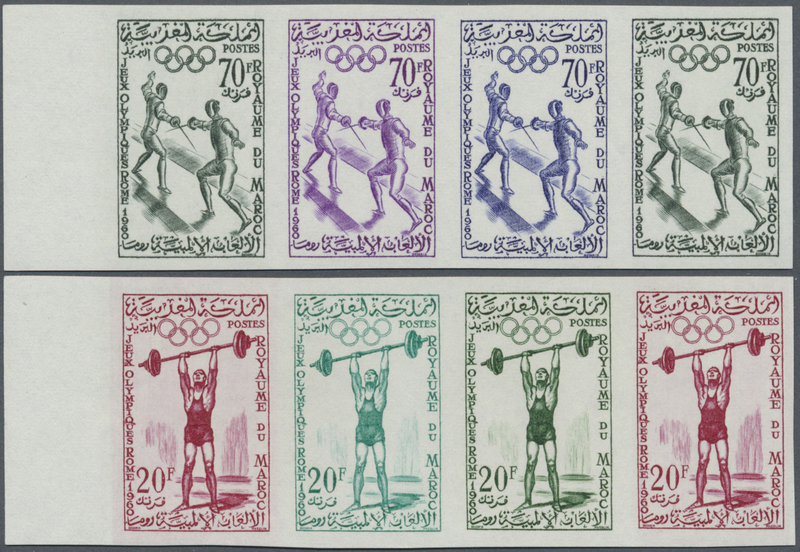 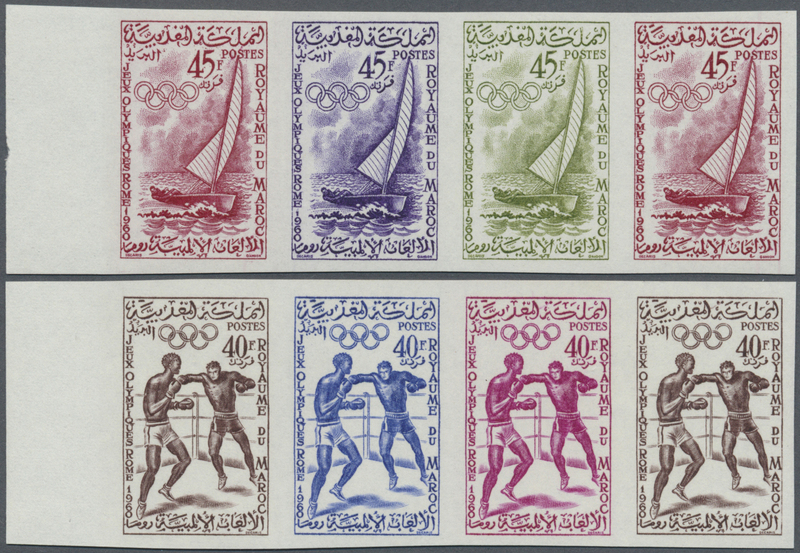 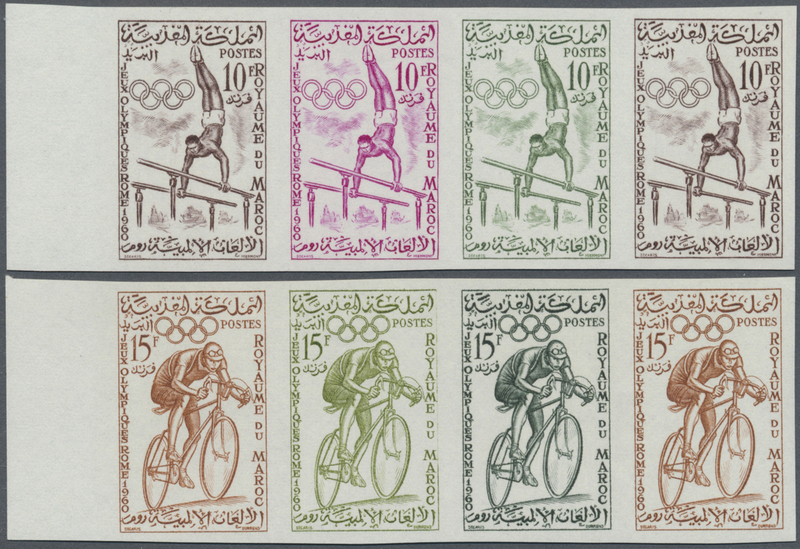 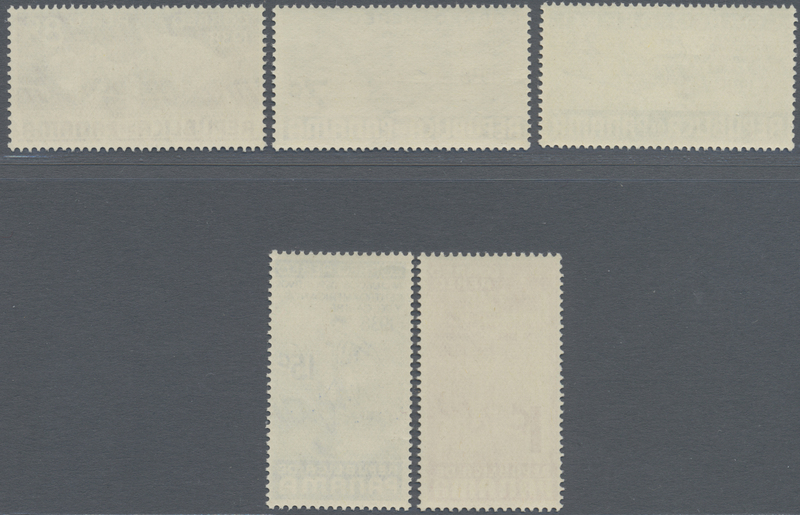 10489 postfrisch (never hinged) ** 1960 Marokko Olympic Games 5 F - 70 F complete set in IMPERFORATED colour proofs, eight values in stripes of four, totally 32 different values mint NH, scarce ! 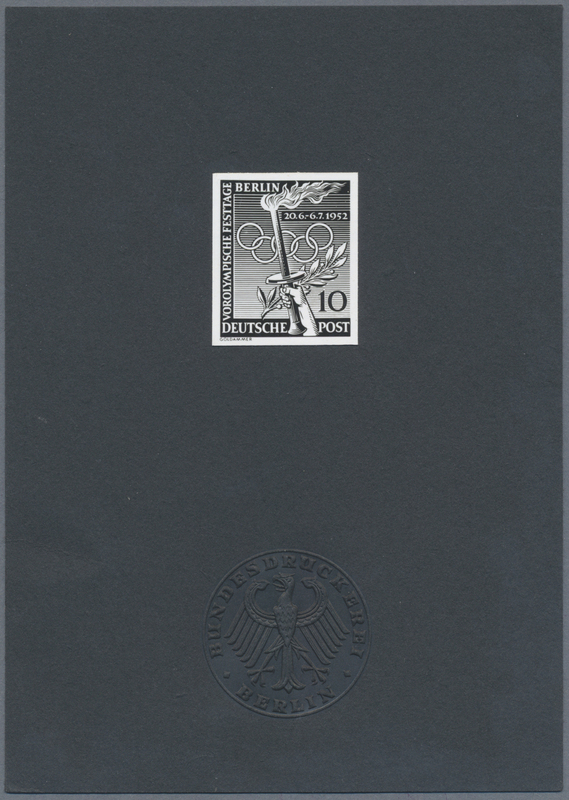 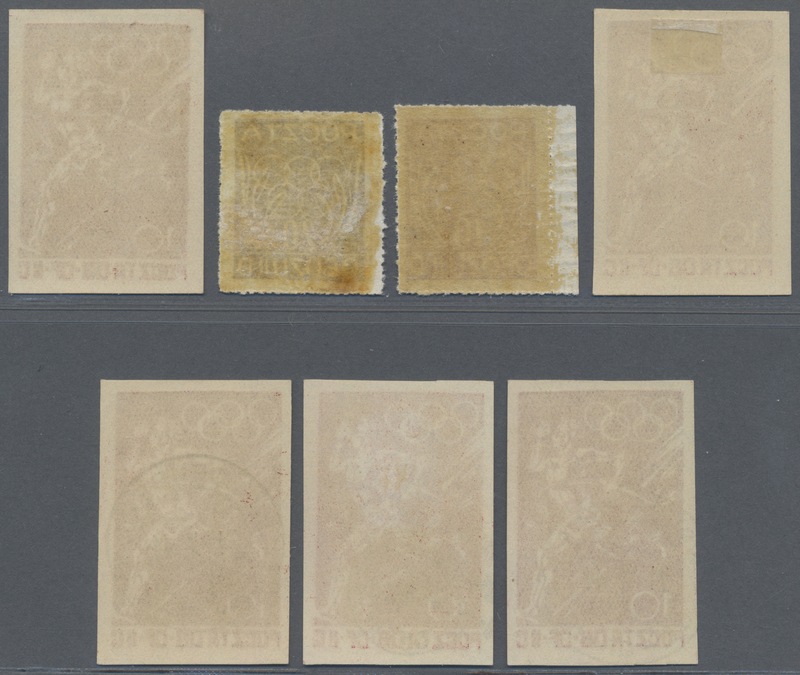 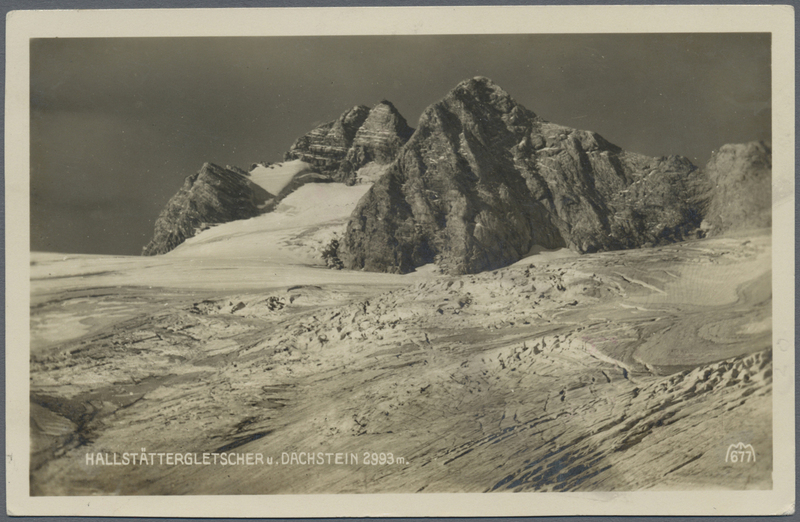 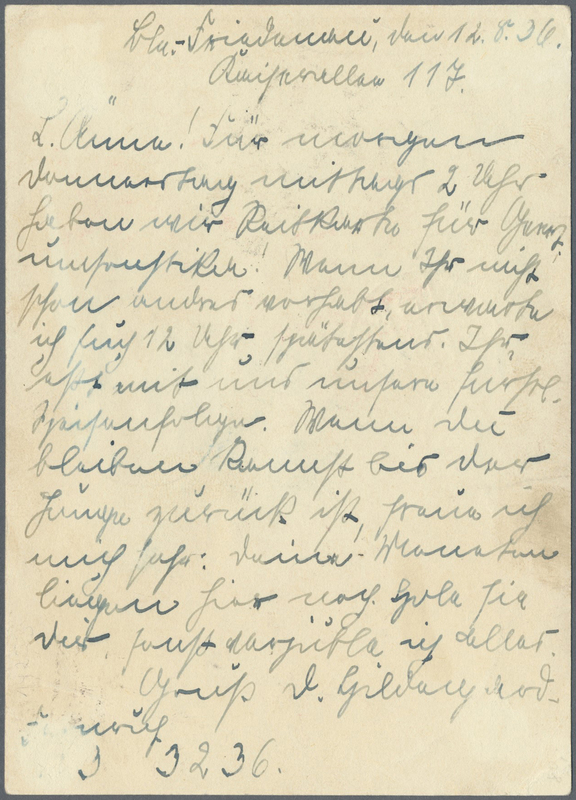 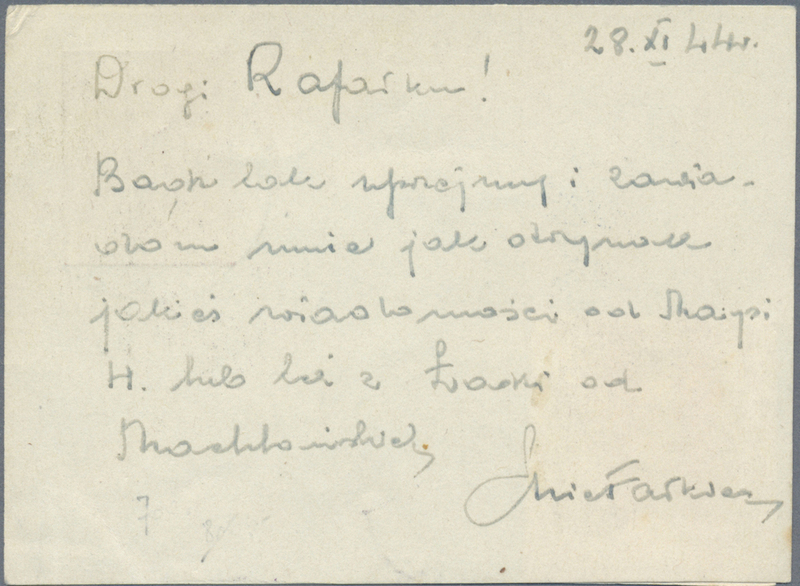 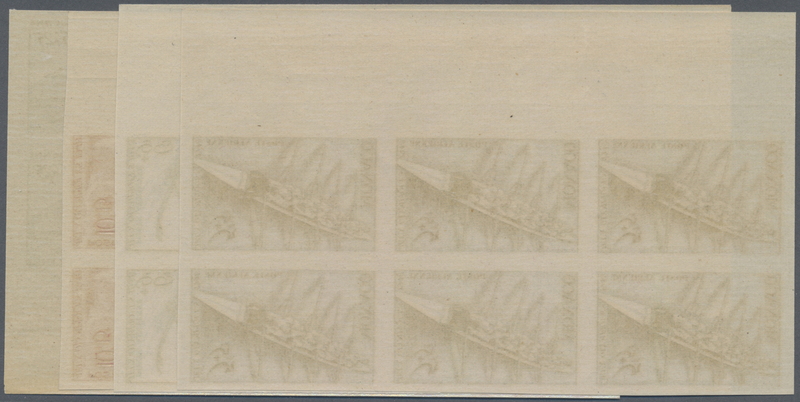 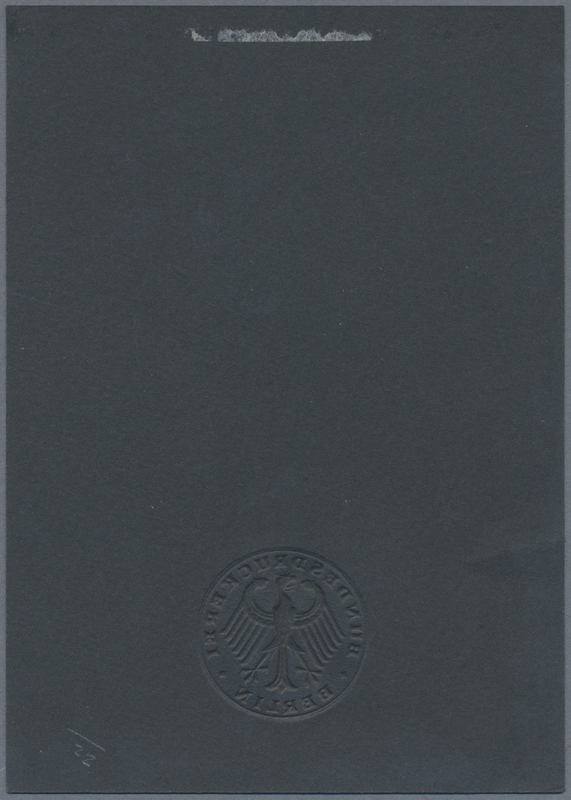 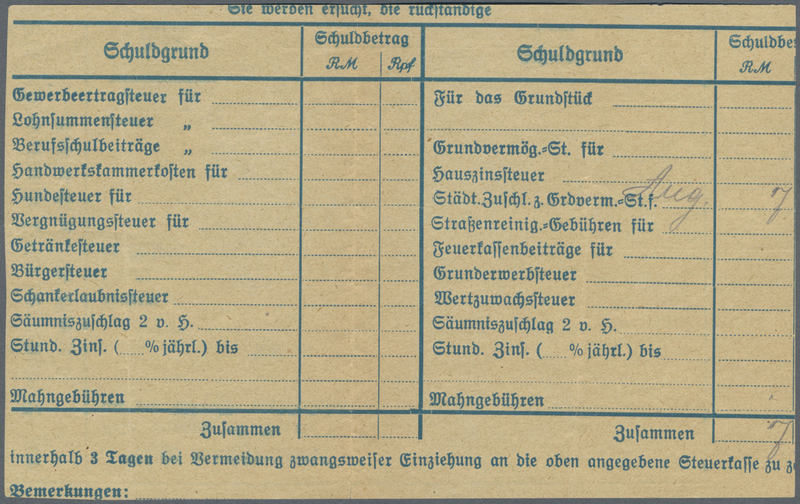 10490 postfrisch (never hinged) ** Bl.24 var. 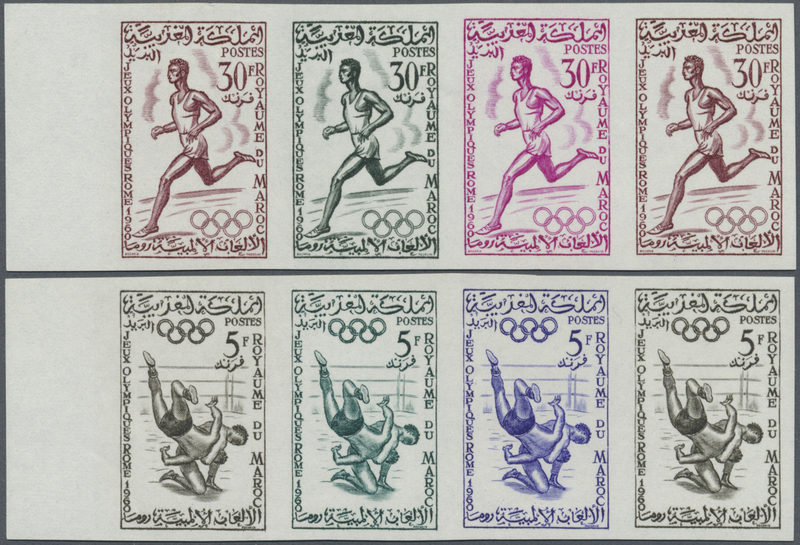 1961, Libanon,Olympics Rome 1960, souvenir sheet with double print of brown color swimming 35+35 P. value, mint never hinged, fine and scarce!